Happy Friday friends, and welcome back to the blog! 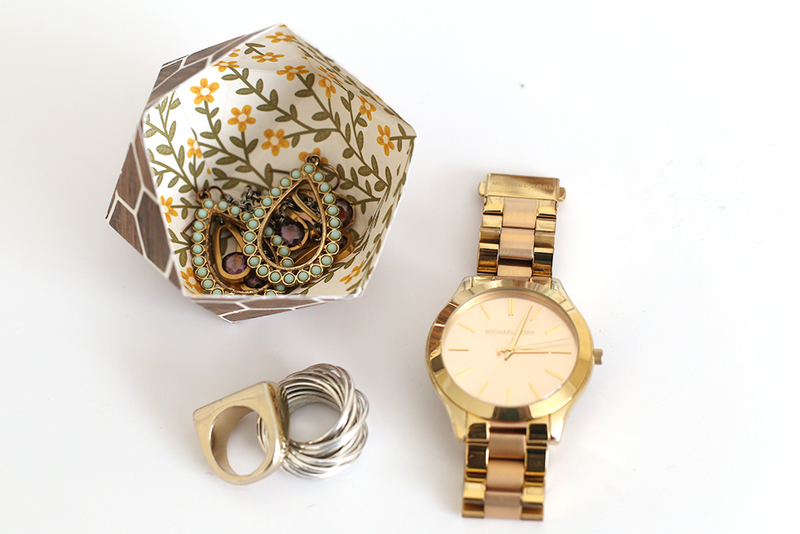 We hoped you’ve enjoyed this week’s “pin-spiration” from our design team. Today we’re closing off “Inspired by Pinterest” Week with a roundup of the Top Ten Most Pinned Projects from our Pinterest boards. Check them out below, and if you haven’t already, give us a follow on Pinterest for some fabulous project inspiration! 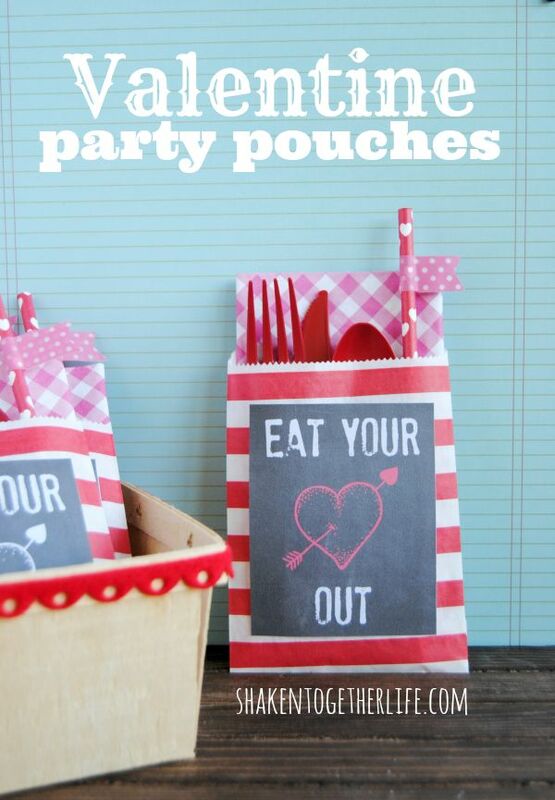 This sweet Valentine’s Day Party Pouch comes in at number 10 with 439 repins, and 46 likes. 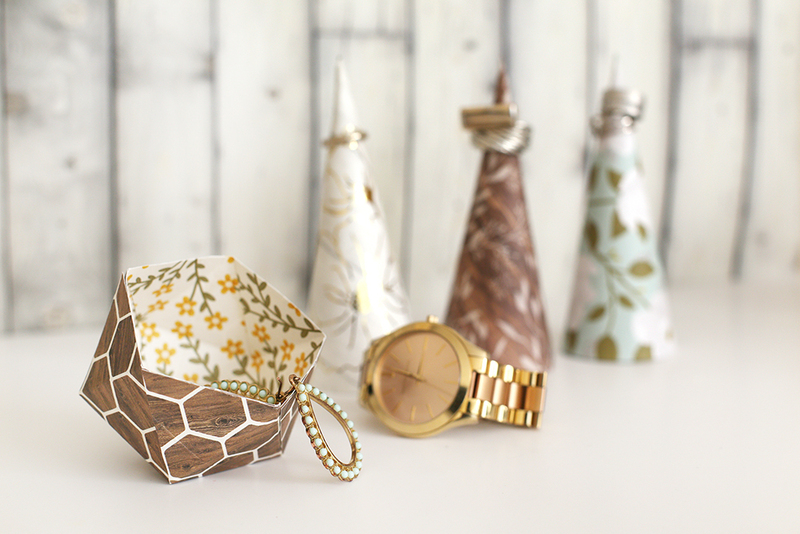 Make some for your next party, whatever the theme, with our Goodie Bag Guide and Glassine Papers. CLICK HERE to pin this to your Pinterest board. 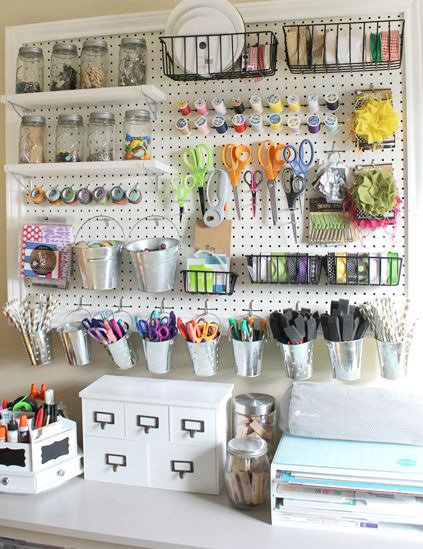 This Peg Board Storage Wall idea, with 492 repins and 78 likes, is perfect for small craft spaces since it takes up vertical rather than horizontal room. If you’re not the DIY type, you can grab a few of our Peg Board Frames from our Organization Gallery collection for your own creative space. To add this pin to your Pinterest board, CLICK HERE. 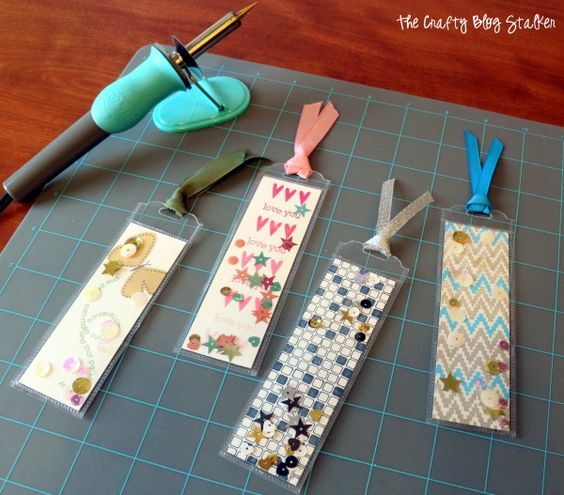 The Photo Sleeve Fuse continues to be one of our most popular tools, and our fans just love this idea for making shaker pocket bookmarks. With 534 repins, and 39 likes, we love the idea too! CLICK HERE to pin this to your Pinterest board. 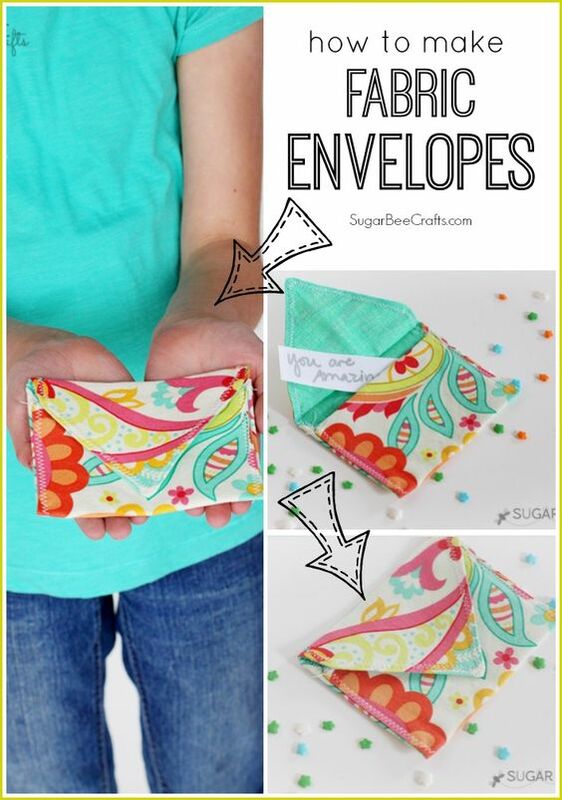 These pretty fabric envelopes (623 repins, 67 likes) are a great way to package a handmade card or other gift. 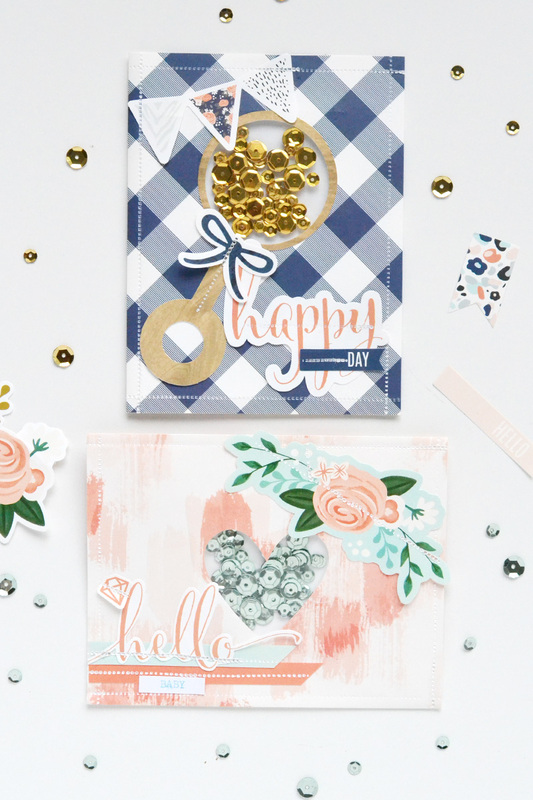 Easily make your own with our Denim Blues fabric paper and 123 Punch Board (or Envelope Punch Board). If you’d like to add this pin to your Pinterest board, CLICK HERE. 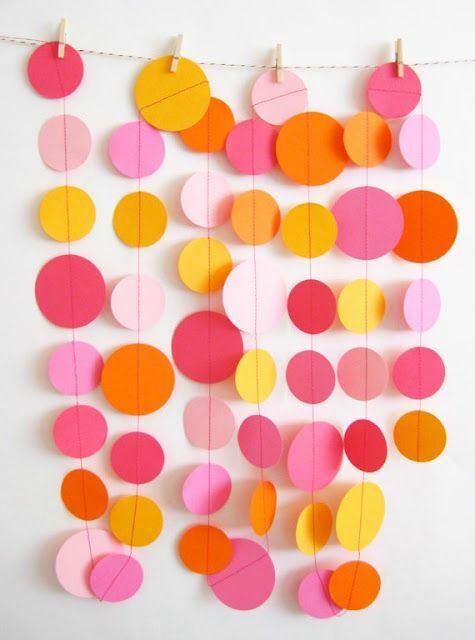 Add some color and style to your next party with a Stitched Party Garland. At least 695 pinners repinned this, and 115 liked it, so you can’t go wrong! Grab our new Stitch Happy sewing machine (available in June–pre order HERE) so you can make your own. This pretty card comes in at number 5 with 957 repins and 80 likes. CLICK HERE to pin this to your Pinterest board. 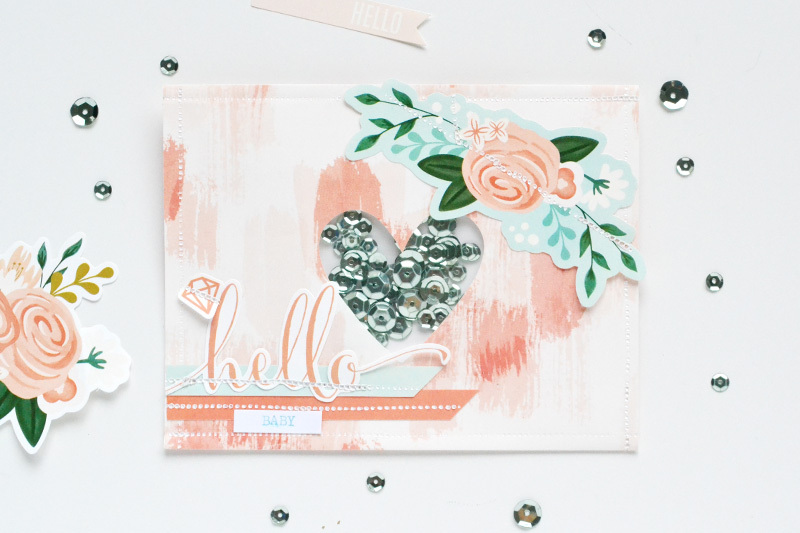 We just love the pretty embossed background! 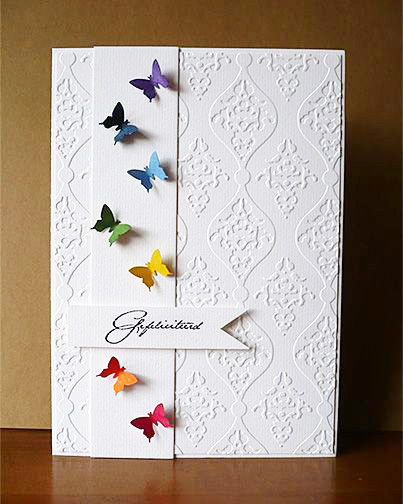 You can get the same look with our Next Level Embossing Folders and Evolution Advanced. We can tell we’ve got some font fans with our number 4 most popular pin at 1076 repins and 93 likes. 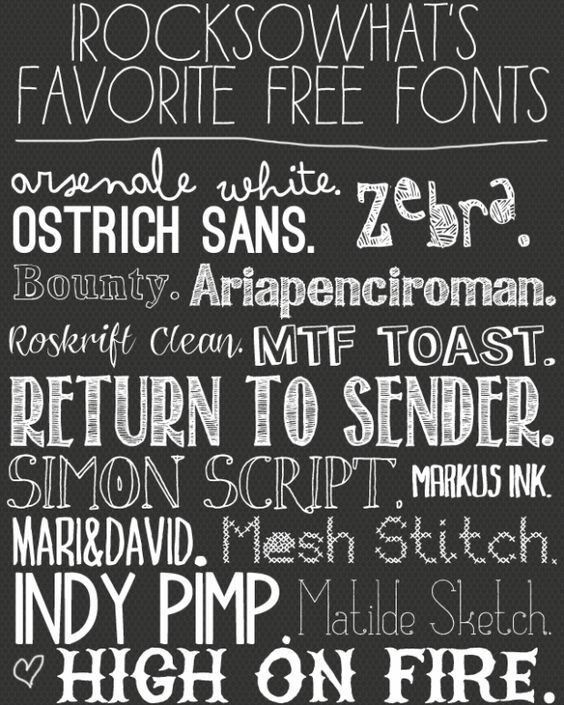 CLICK HERE to pin this to your Pinterest board so you can grab these fun free fonts. 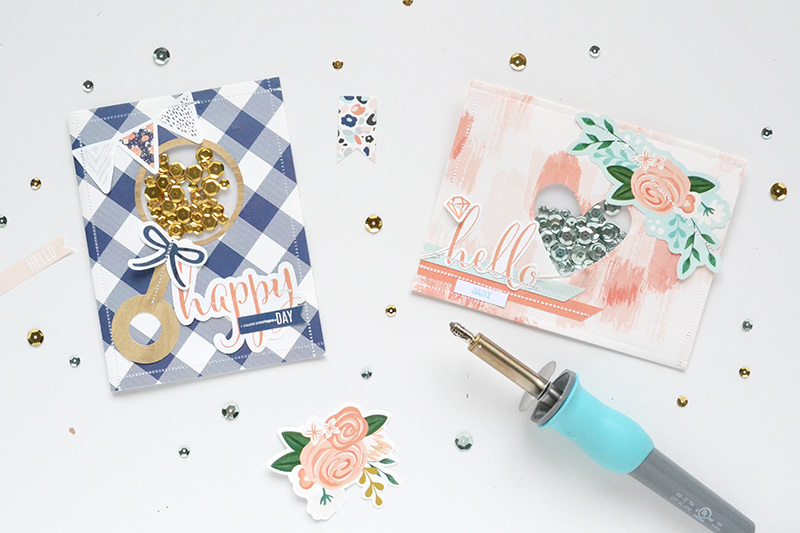 Remember, you can add beautiful metallic handwriting and accents to your craft projects with our Heatwave Foiling Tool and Stencils. This darling interactive gift card holder has 1174 repins and 135 likes. CLICK HERE to pin this fab project to your Pinterest Board. 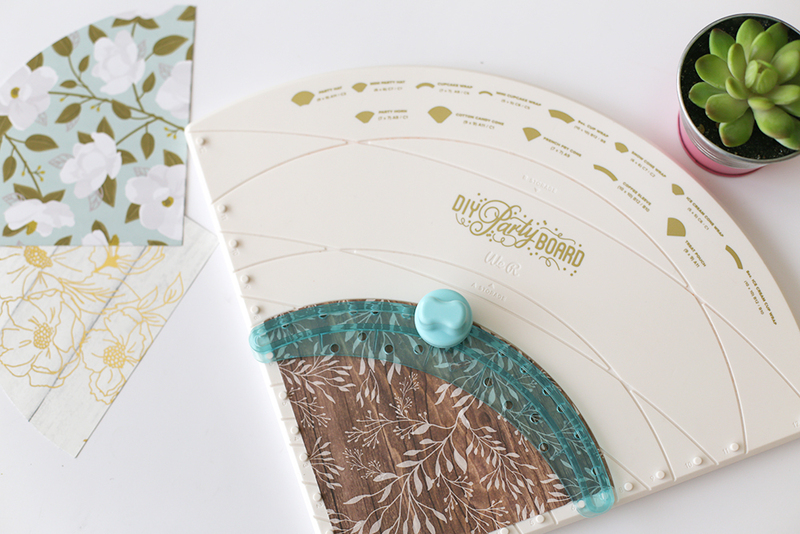 If you’d like to make one for a loved one, you can use our Evolution Advanced and Gift Card Holder Pop-Up Die. 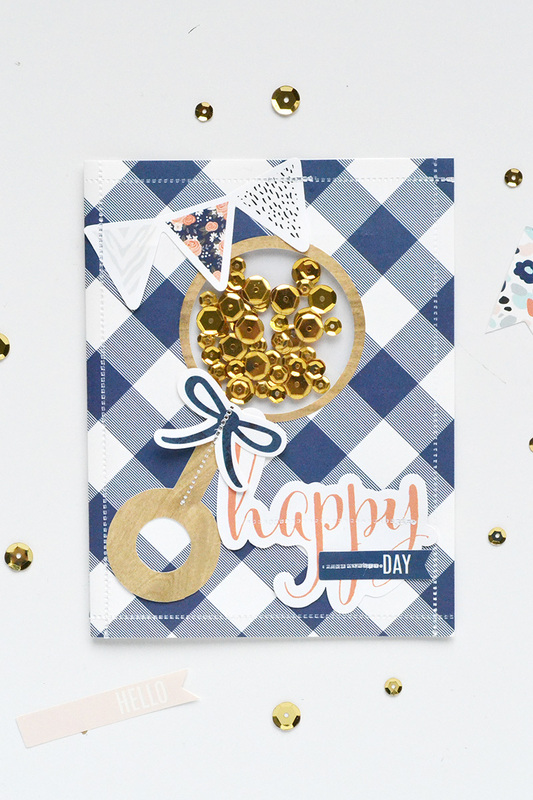 This DIY gift card holder made with the Envelope Punch Board is our second most popular pin with 1853 repins and 208 likes. 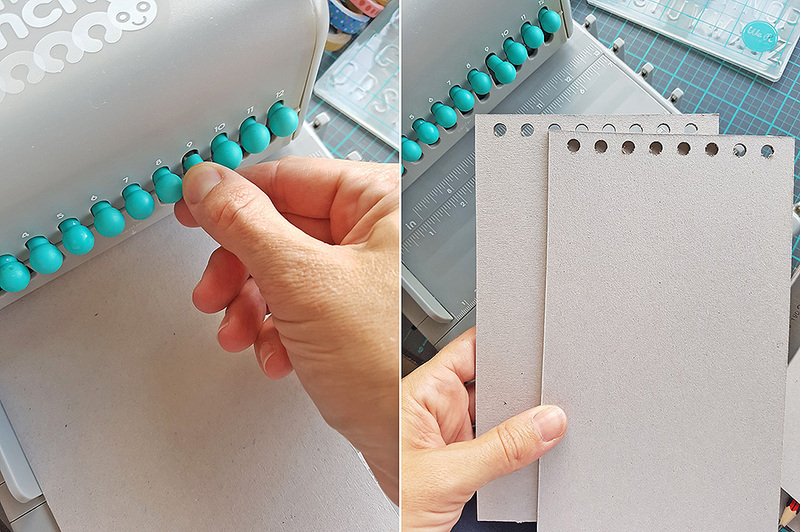 CLICK HERE to pin this and to learn how to make one with your Envelope Punch Board (or 123 Punch Board). 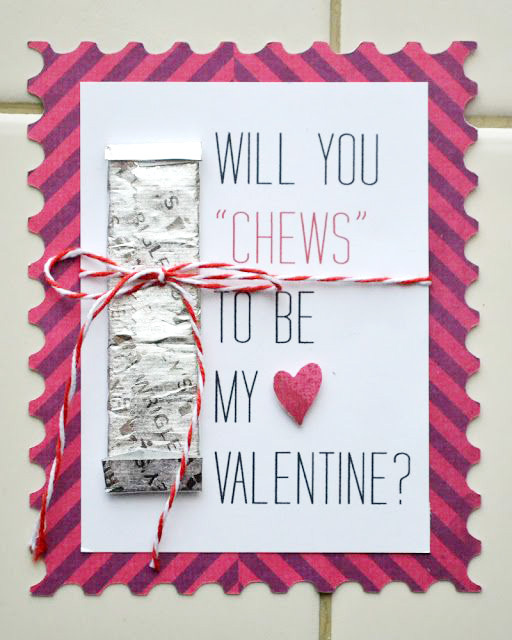 Grab your die cutting machine, some baker’s twine, and some sugar free gum to make our most popular Pinterest post, with 6385 repins and 1211 likes. Moms will appreciate their kids bringing home a little less sugar from the Valentine’s Day party! Thanks for joining us this week with our Pinterest projects, and we hope you’ve found some helpful inspiration and ideas. Don’t forget to follow us on Pinterest HERE for the latest project ideas with our newest tools. Hello crafty people! 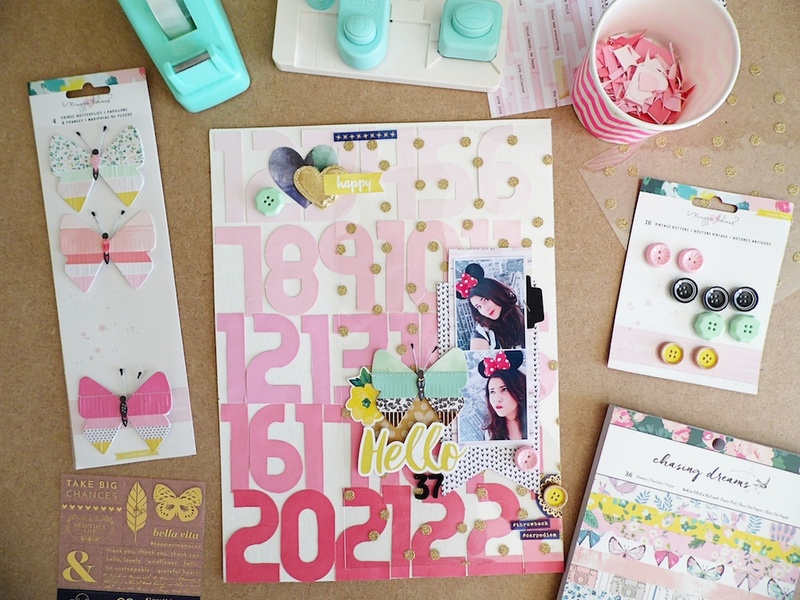 Soraya here with you today to share a Pinterest inspiration project! Who doesn’t know about Pinterest? And more than that, who hasn’t already spent hours and hours admiring the beautiful pictures, DIY, inspiration homes etc? Not me, ha ha! So today I would like to show you how to make a fun layout using an inspiration piece from “the paradise for the eyes” well, I meant Pinterest! Let’s go! 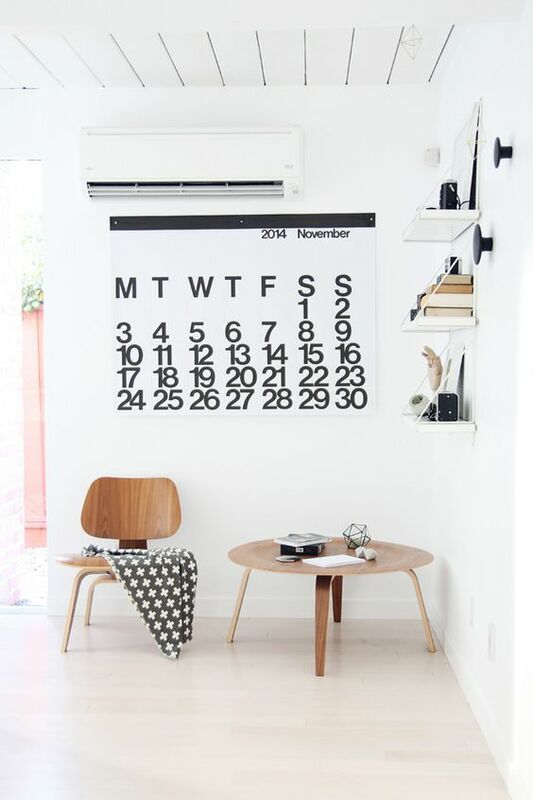 First of all, here is the picture I have chosen in the Pinterest gallery : a huge wall calendar in black and white, with big numbers. I just love how it decorates the office and the brightness it brings to the room. So I decided to take this design as an inspiration for my layout. 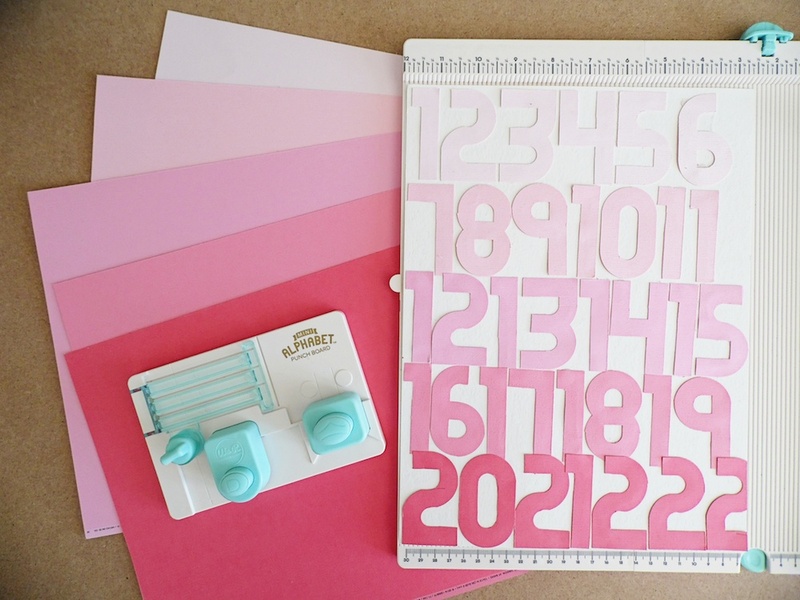 For the layout background I also wanted to play with big numbers so I grabbed my Mini Alphabet Punch Board and five sheets of pink cardstock to create an ombré look. It was so fun to punch all the numbers in different colors, to assemble them on my background and finally collect the confetti leftovers! 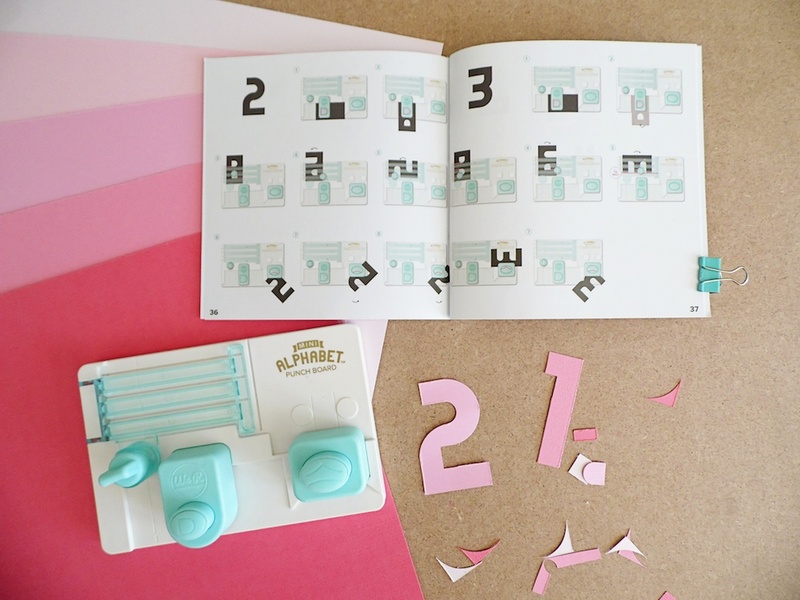 And after assembling the numbers, I made my page design directly on them with a gorgeous glittered transparent paper which allows us to see through it. And voilà! Hope you had fun joining me today! Feel free to be inspired by Pinterest and come to show us! And happy creating to you all, until next time! 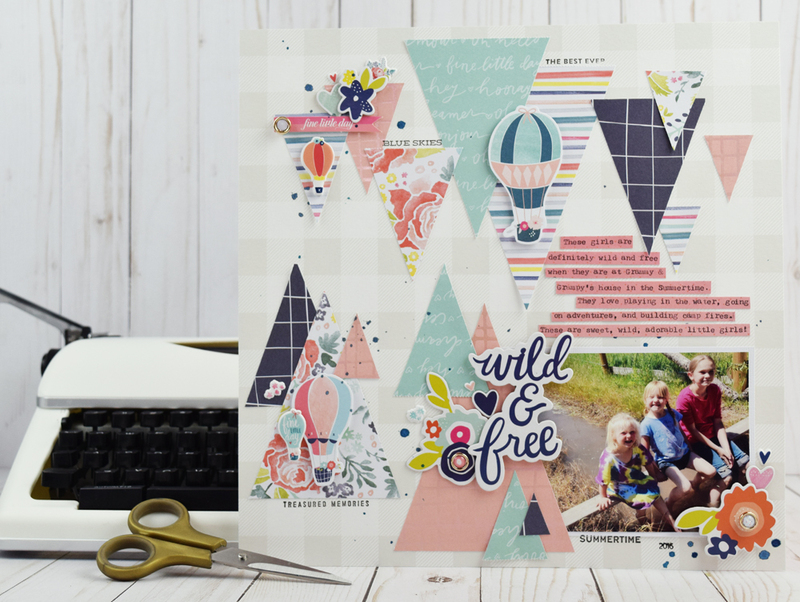 Hey there We R Memory Keepers friends and fans, Becki here to share with you a layout I created using the Banner Punch Board and my Typecast Typewriter. 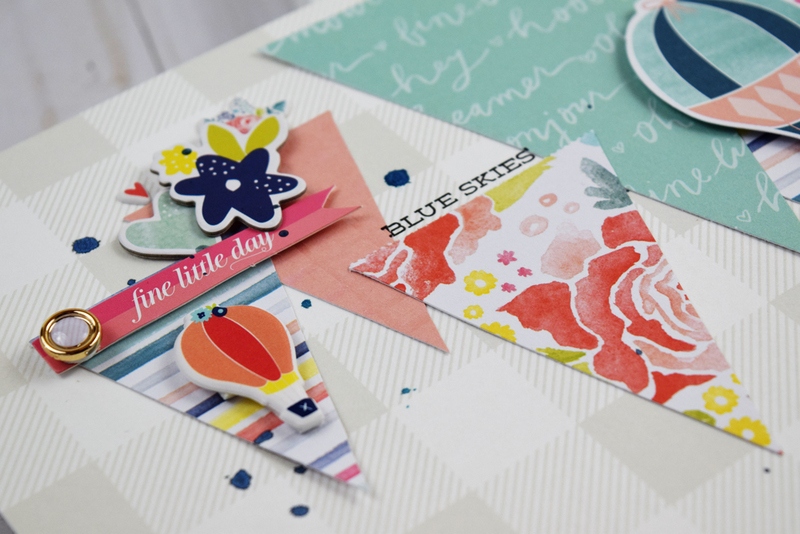 I love the triangle trend that I’ve seen lately in the scrapbooking community. I found THIS is the layout on Pinterest. This layout inspired me to create a layout full of triangles. I’ve wanted to try creating a layout with triangles but I’m not very good at cutting out triangles by hand. My hand cut triangles always end up looking wonky and uneven. 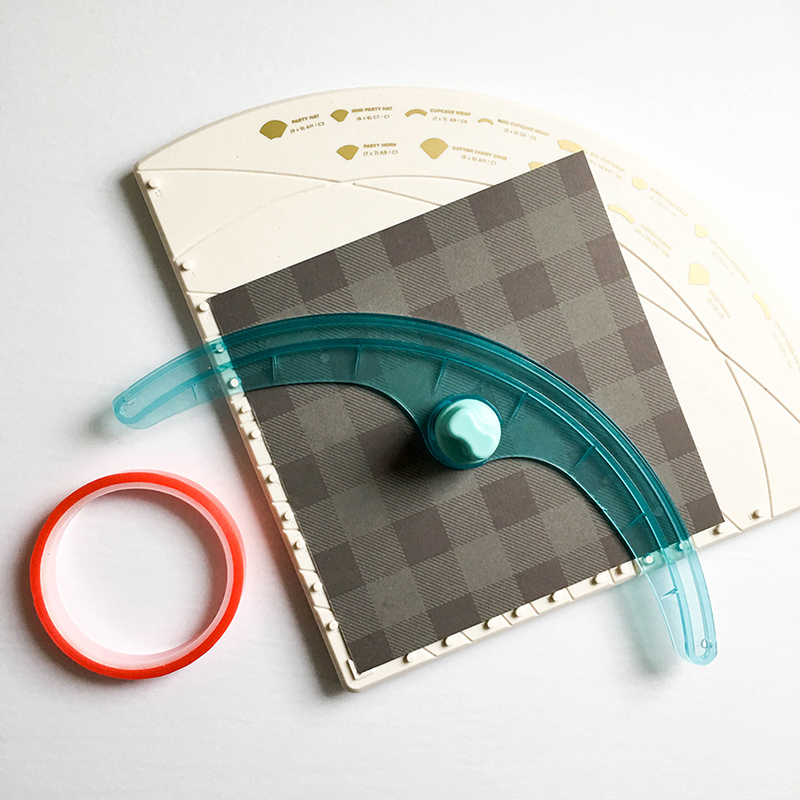 Finally, I realized that I’ve had the perfect tool for cutting triangles right in my office the entire time! 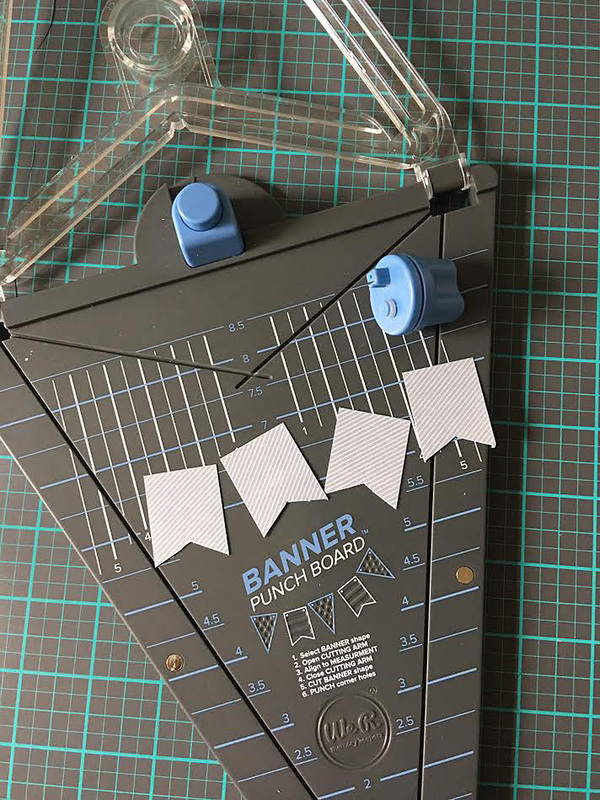 The Banner Punch Board is perfect for cutting triangles of all sizes. 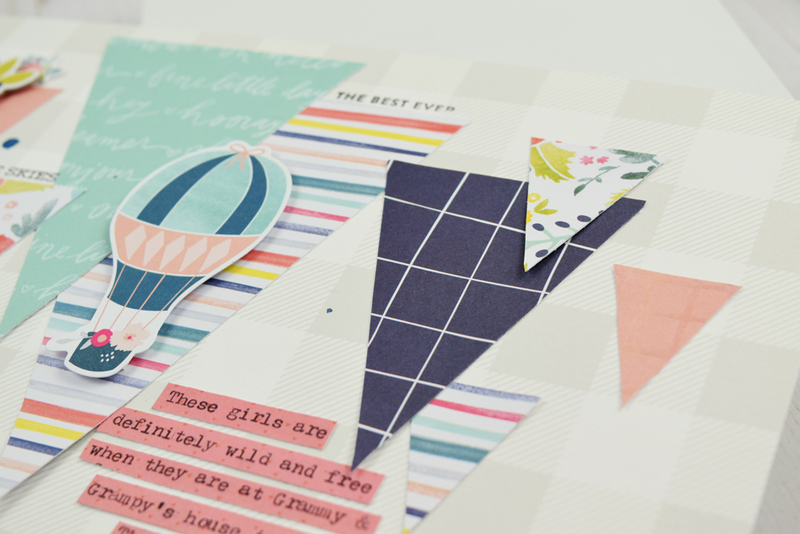 I started creating this layout but cutting several triangles out of patterned papers in lots of different sizes. 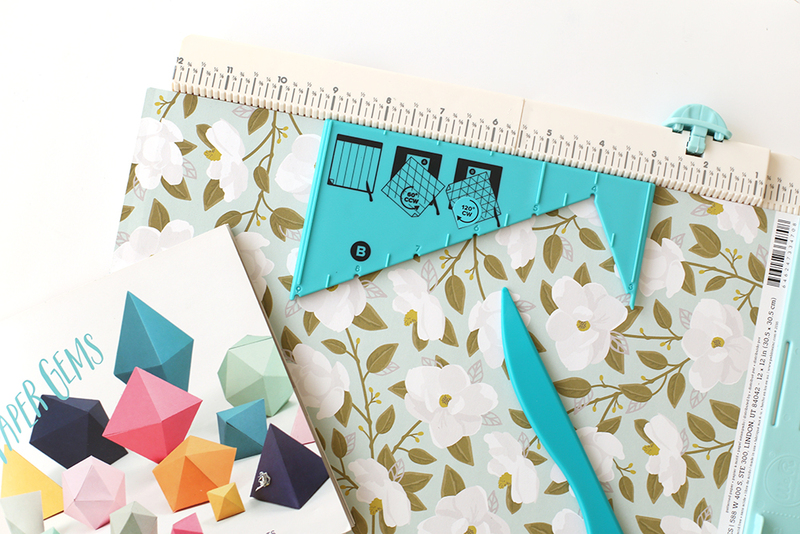 I chose 6 different patterned papers and cut 3 triangles out of each pattern (one small, one medium, and one large). Then, I arranged the triangles around the layout creating a visual triangle with each pattern/color. After arranging the triangles on the background of the layout I adhered the photo in the lower right corner of the layout. Using my Typecast Typewriter, I typed my journaling on a coordinating piece of patterned paper. 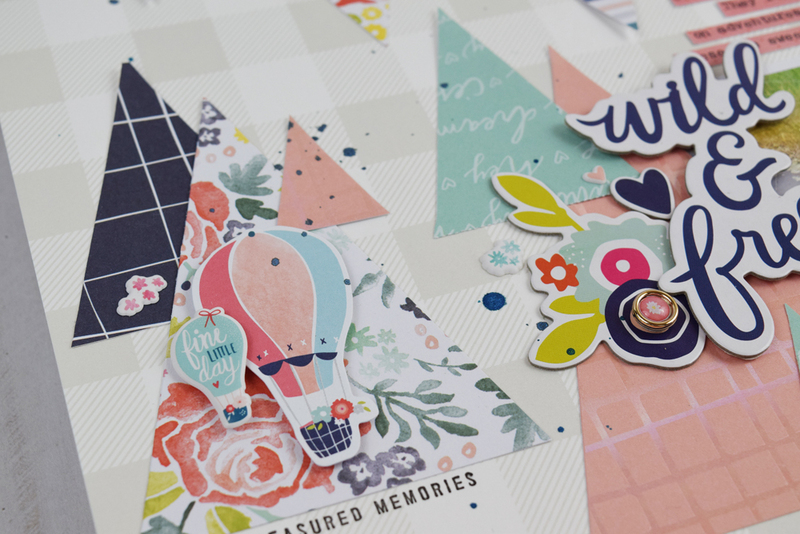 I cut the journaling into strips and nestled the strips into the triangle background. 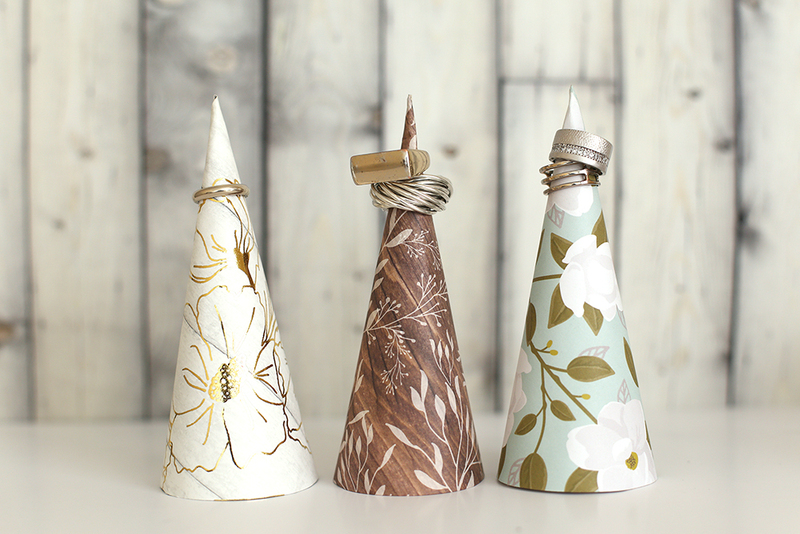 Do you love the triangle trend as much as I do? 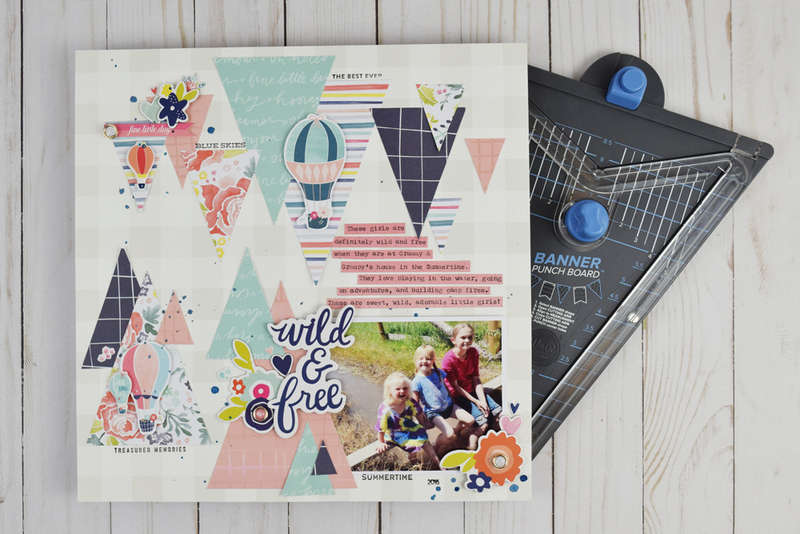 Try using the Banner Punch Board to create a layout that’s full of perfectly cut triangles! 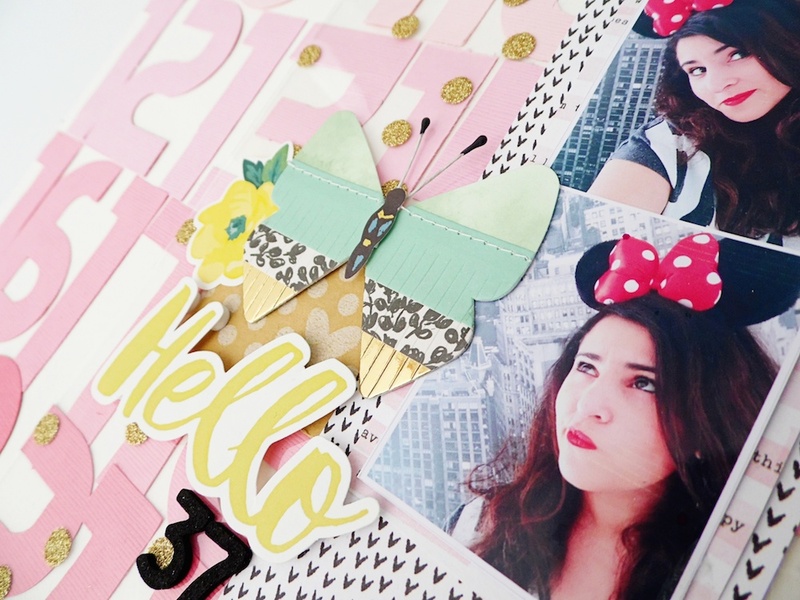 Thanks for stopping by the We R Memory Keepers blog, I’ll see you again soon! Hi! Welcome to the We R blog! It’s Eva Pizarro here today sharing some jewelry organizers for your rings, earrings, bracelets etc. 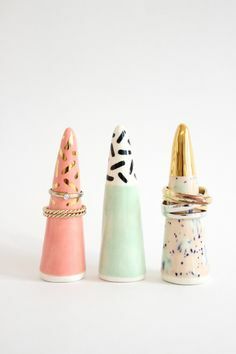 These ring cones are super cute and I thought I could easily make them using my DIY party Board! I decided to use some papers from the Simple Life collection by Pebbles Inc. I simply placed them on my board and cut them using the C7 guide. 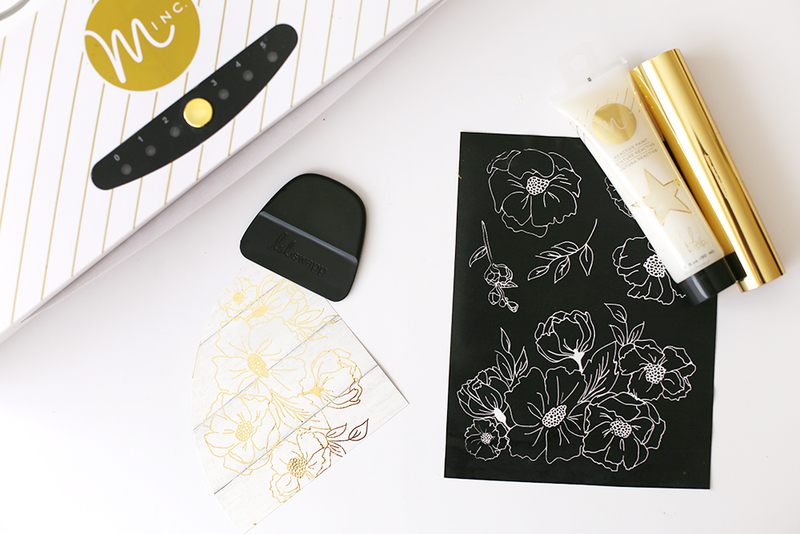 To give my papers a little more shine I used the floral art screen from Heidi Swapp and Minc Reactive Paint. It was my first time using this technique and I was amazed at how easy it was to get a perfect image! I let it dry and then run my paper through my Minc with gold foil, the result is gorgeous! I rolled my cones slightly tighter and glued them with hot glue. To give the cones some weight I added white clay to the base. I pushed it in the base of the cone with my finger, and then let it dry. To complement my ring organization I decided to make a paper bowl. I followed this tutorial but I used my Triangle score guide to mark my paper. I love this tool! You can create amazing geometric shapes with it! I scored my paper every 1.5 inches and this way you can get 2 bowls out of your 12 x 12 inch paper. You can insert one bowl inside the other or leave it single like I did. I love how this project turned out! It is very simple and I think it would make a great gift for a friend! 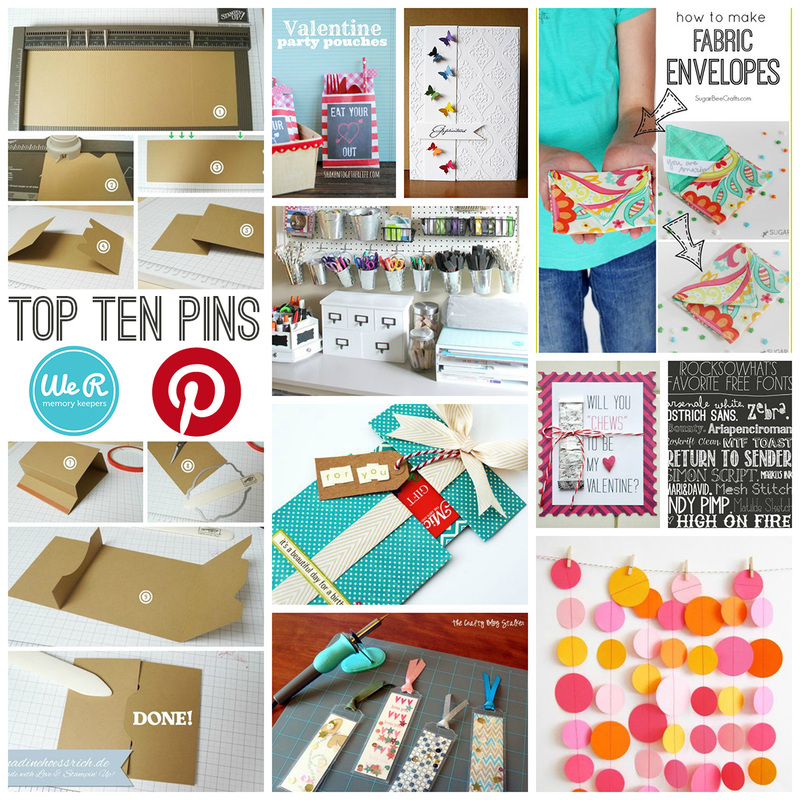 Hello there We R fans, and welcome to “Inspired by Pinterest” Week here on the blog. Our designers have found some projects on Pinterest that inspire them, and have created their own project based on that inspiration. You’re going to love what they’ve come up with! Check it out. Hello and welcome back to the blog! Chantalle with you today to chat about a way to make learning your ABC’s a bit more fun for kids. I was inspired by a project I saw on Pinterest involving a book bound from paper bags. 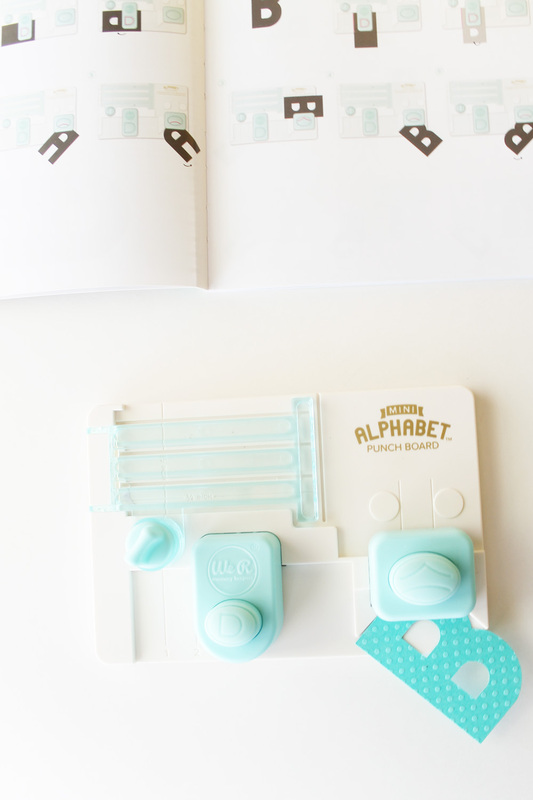 It was such a sweet way of storing memories but I also loved the interactive element of it and thought I could combine my alphabet punchboard and my Cinch Binding Tool to create something fun and interactive for my little learner! My ‘super fun’ alphabet pad consists of several pockets, bound together. I’ll admit, I did worry it was too fat to bind at one stage! Lol. But my awesome Cinch made light work of the 26 pages plus chipboard covers! 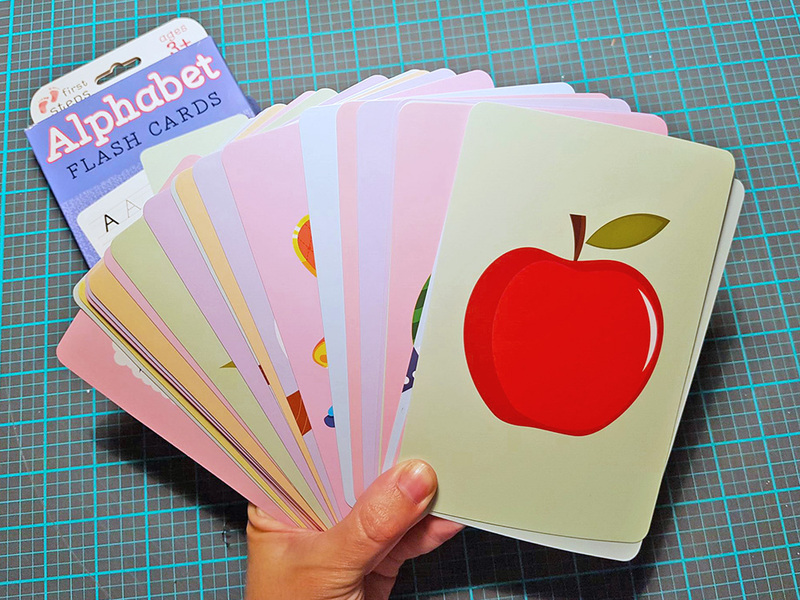 Let’s learn our ABC’s by sliding out the cards! 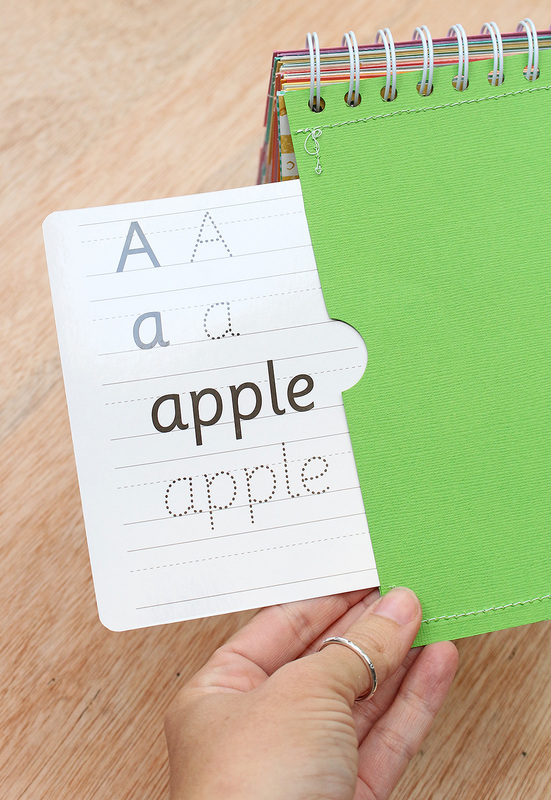 Let’s see what word starts with the letter ‘A’… yep, you guessed it, ‘Apple’! To make my cards slide in and out of custom pockets, I had to cut them down a bit, to be able to secure them inside, without falling out when pulled. To do this, I popped each of them onto my Trim & Score Board and measured about a quarter inch down from the top and up from the bottom. I left another quarter inch on the left hand side where I would be inserting them into the sleeves later on. I then cut along the top and bottom guide marks I had made, leaving the left hand side as is. For my sleeves, I created 26 pockets using coordinating shades of Bazzill Cardstock (see materials list for colours used) I left a quarter inch extra at the bottom of the pocket and half an inch at the top to accommodate for binding. I rounded the corners of my flashcards using my Crop a Dile Corner Chomper and then inserted them into their sleeves. In order for them to stay in place during use, I had to sew them inside the sleeves – just a little bit above and below the card as shown in the picture below. The quarter inch or so of stitching will allow the cut out area to slide out but hold the area that I left at the original height of the card, inside the sleeve. Once all my sleeves were sewn, it was time to start putting the pad together. For kids, a sturdy cover is a must. 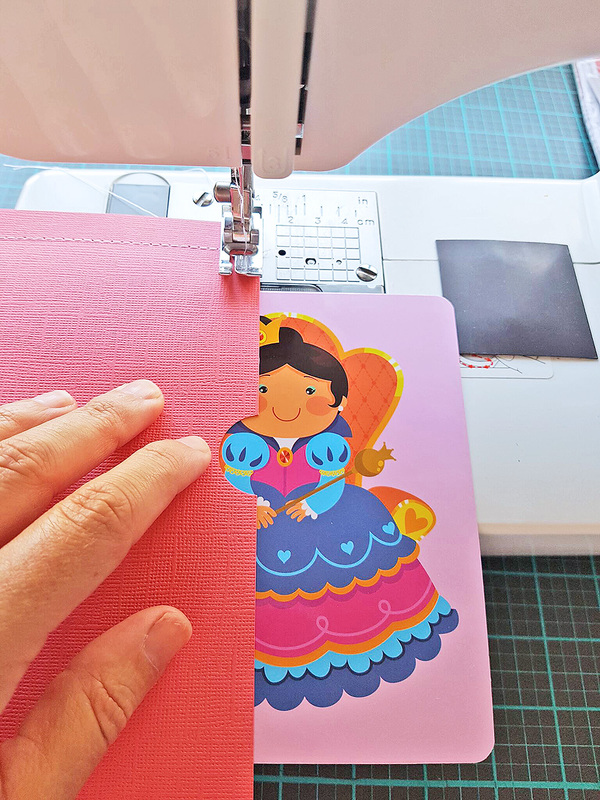 I’ve used some 8×8 Cinch Designer Book Board which I cut down to size and then covered with some gorgeously fun Amy Tangerine ‘On a Whim’ papers. The image below shows just how easy it is to create a bound item using The Cinch. Simply pull out the corresponding peg to choose how many holes to punch. Note: In this picture you will see I punched my holes before I covered my board. I would recommend covering your chipboard before you punch, for a neater finish. Now that my cover was sorted, it was time to move on to embellishing my sleeves. I wanted corresponding letters to match my flashcards. 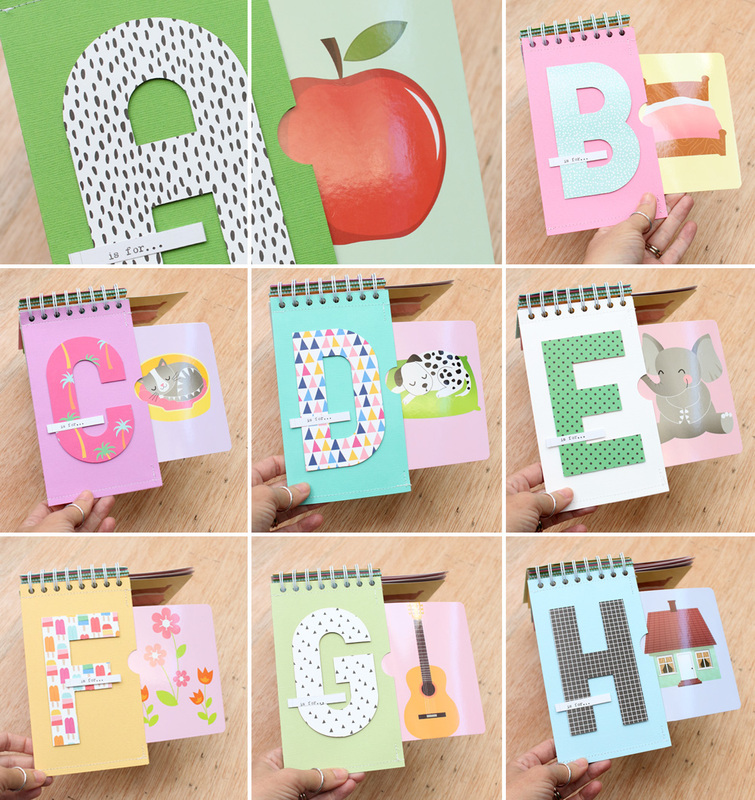 Enter my Alphabet Punch Board! 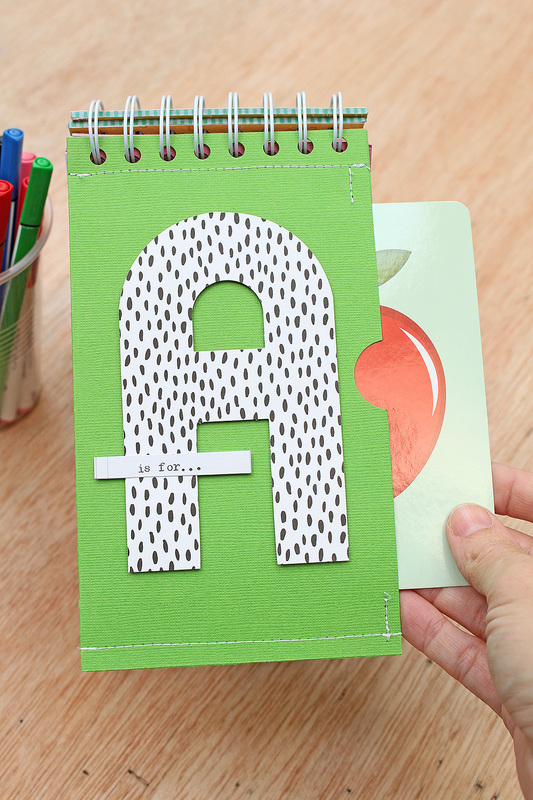 This clever punch board allowed me to create matching lettering for each letter of the alphabet. The ‘m’ and ‘w’ turned out to be a bit too wide for the size of my sleeves, so I used the adorable (seriously, you have to have one they are SO cute!!) 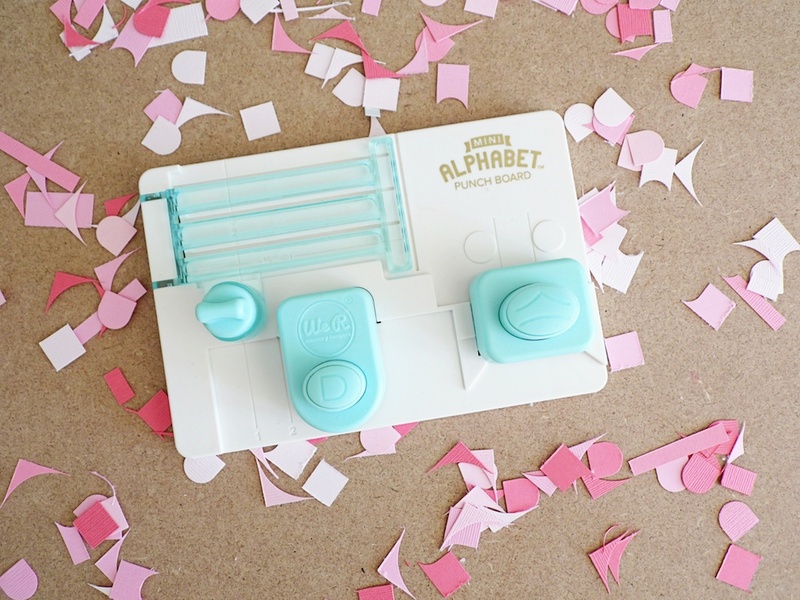 Mini Alphabet Punch Board to whip up two of each letter and mount them underneath each other. 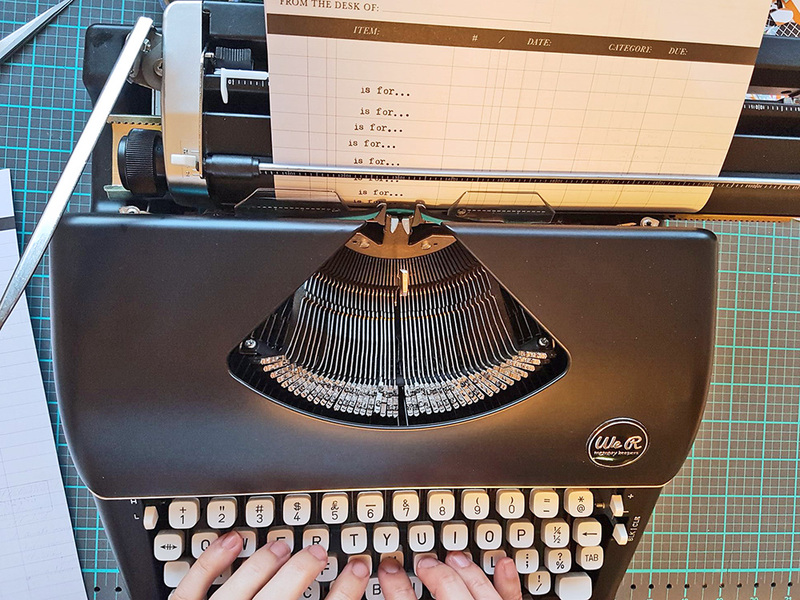 The final piece that I needed on each were the words ‘is for…’ so I popped some grid paper from my Typecast 8.5 x 11” pad into my Typecast typewriter and started typing up my text. I chose to use the grid paper so they would all look uniform. … and ‘I’ to ‘Z’. 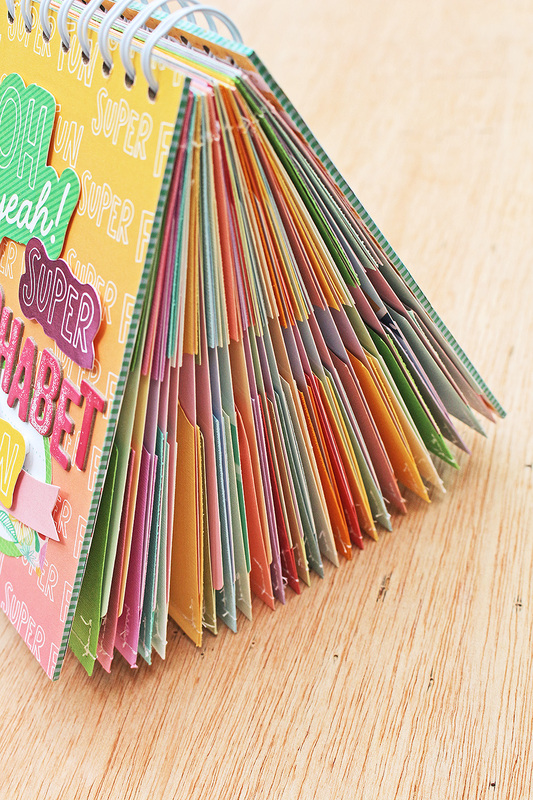 For an extra fun element, each of the cards has a reusable area to practice lettering on! This is especially handy for my little bug, who sometimes writes her letters back to front. Simply lay the pad flat, grab a whiteboard marker and you’re all set! I hope you have enjoyed my post today. If you decide to give this idea a try, please tag us in your pictures on social media – we would love to see them! Happy Friday We R friends! I hope you’ve enjoyed all the baby inspiration this week. Today I’m going to finish things off with a set of boy & girl shaker baby cards that I made with my Photo Sleeve Fuse, along with some FUSEables plastic paper and embellishments. I started by heating up my Fuse tool for 10 minutes. It’s important to let it heat up long enough to get the best results. Then, I used some 2 inch plastic pouches to create shaker pockets, filling them with sequins, and fusing the four sides to the back of the FUSEables card windows. Then I fused the back flap of the card front closed, for a more finished look on the inside of the card. For the girl card, I added some FUSEables plastic ephemera to the card front with my Fuse tool. 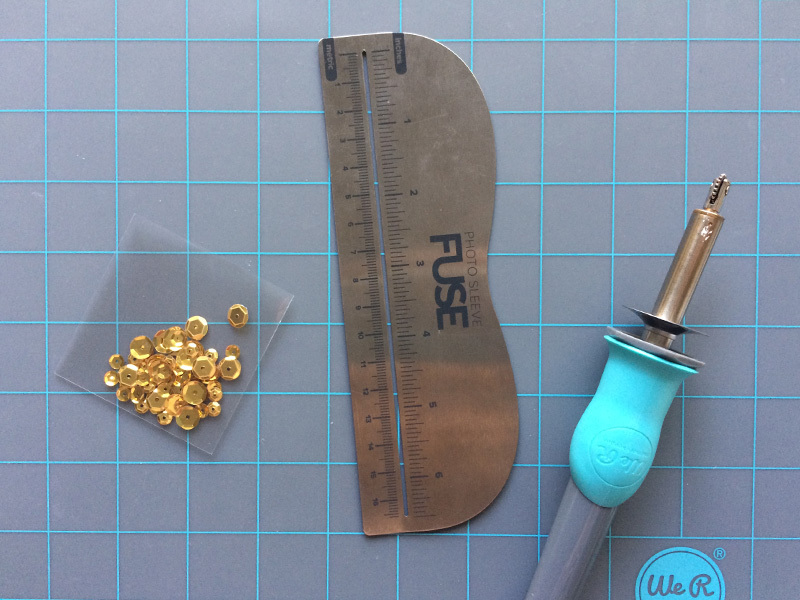 No adhesive necessary with the FUSEables plastic paper and Fuse tool! And, I love the way the fused lines look like stitching. 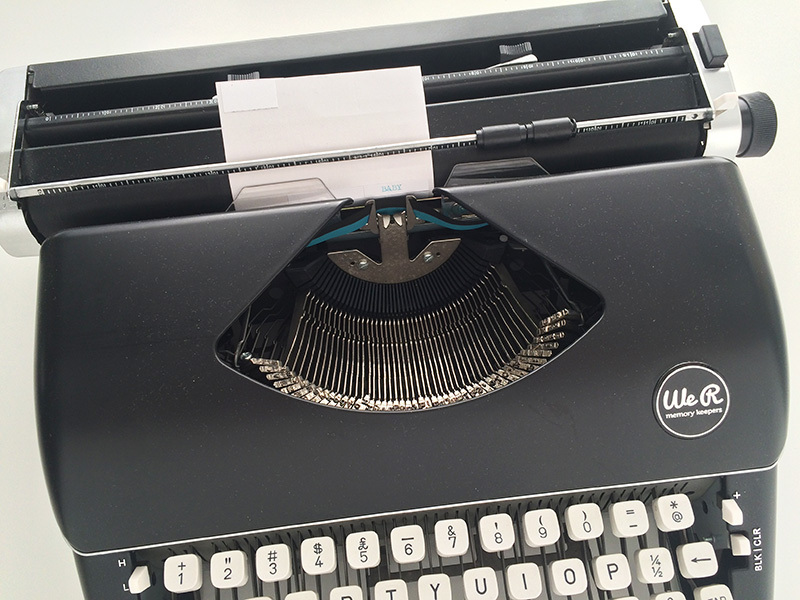 I added a small self-adhesive label where I had typed the word “BABY” with my Typecast typewriter. I love how easy it is to add text to my projects with the Typecast! To make the boy card, I made the circle window into a baby rattle by cutting a handle from some FUSEables paper with my Cameo. 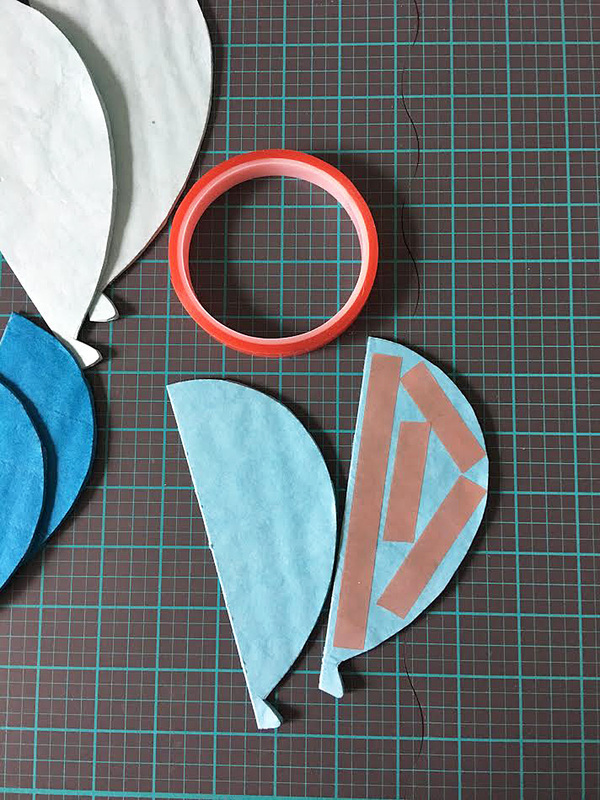 For a tutorial on how to cut plastic sheets with the Cameo, CLICK HERE. 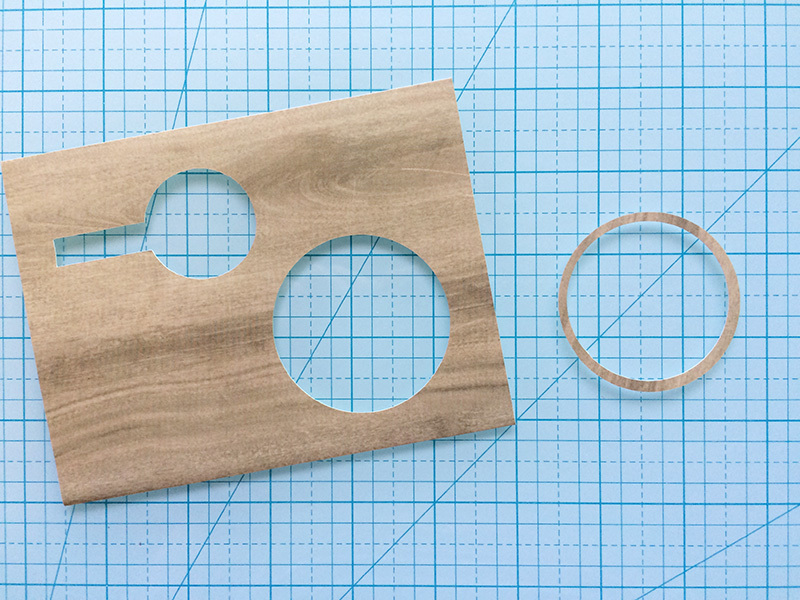 Next, I cut a ring out with my circle cutter to go around the shaker window and glued it to the card front. I finished it off with some FUSEables ephemera, again with only my Fuse tool and no adhesive! Thanks for joining me today. I hope you’ve found some helpful project inspiration. Enjoy your weekend, and be sure to check back next week! Hello We R fans, Laura here! 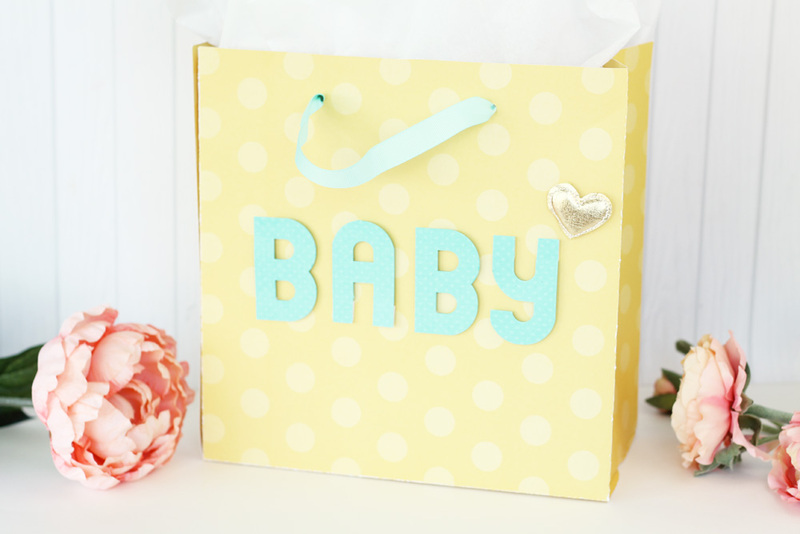 Today, I am going to share with you how to create a custom gift bag for a baby gift. It would be perfect for a baby shower or a new mom. You can customize the colors and size to perfectly fit your gift. 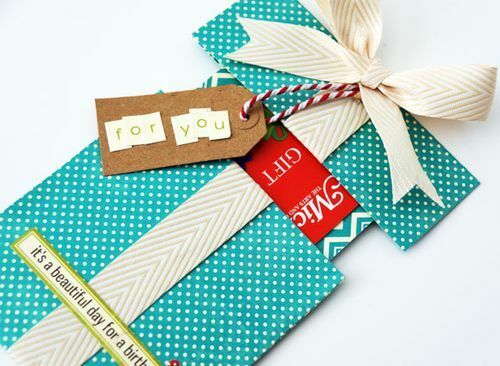 To create the gift bag you will need the Template Studio with the gift bag guide. The Template Studio works with poster board sized paper. We R Memory Keepers has so many beautiful designer posterboards to choose from. 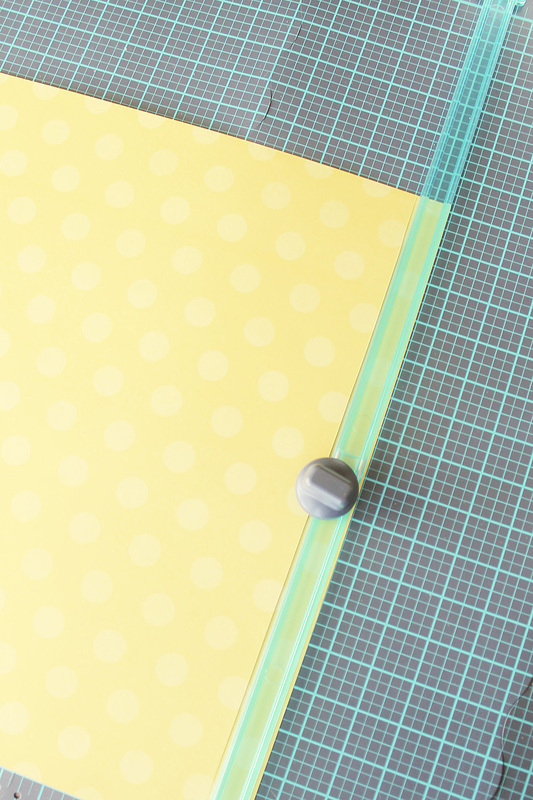 I chose a pretty yellow polka dot posterboard for my bag. 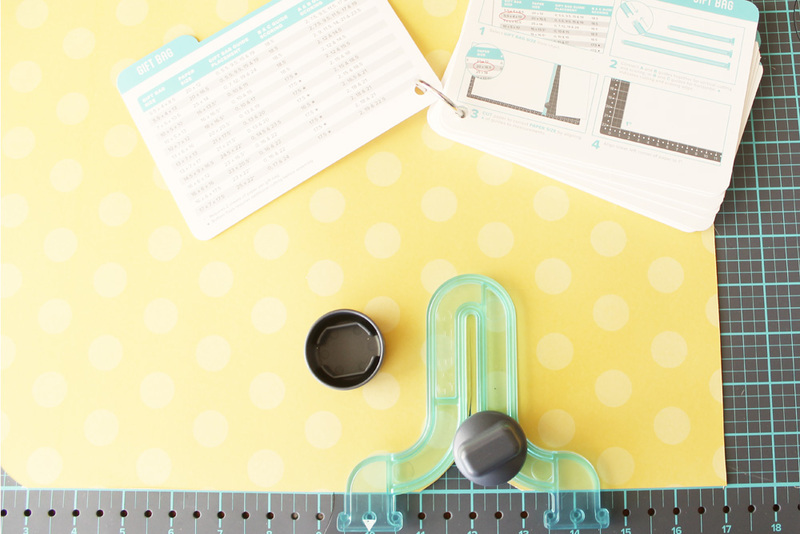 You will use the straight guides to cut your paper to the correct size. Since I was creating a 10” x 5” x 10” size bag, I needed to cut two sheets of posterboard. I was able to get them both cut out of the same piece. 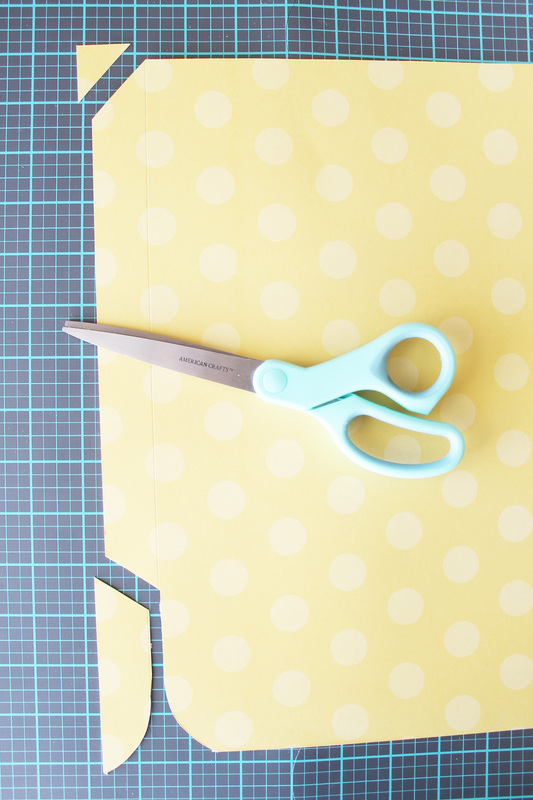 Use the gift bag guide and the instructions to cut notches in the bottom of the bag. Then you will need to score the bag in several spots to be able to fold it properly. To create the larger bag, repeat the steps on both sheets of posterboard. Trim off the excess from the corner with the small fold. This is where you will attach your bag together using strong adhesive. Fold the bag on all the score lines. Attach the sides of the bag together and use adhesive on the bottom. I used my Crop-A-Dile to punch holes at the top of the bag to thread some ribbon through. 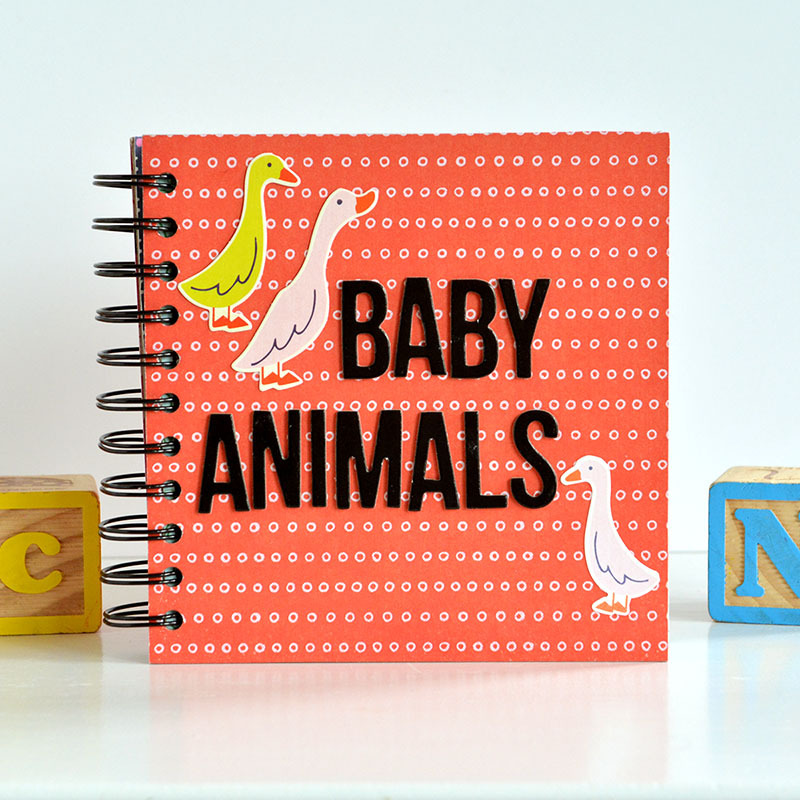 Next, I used the mini Alphabet Punch Board to spell out the word “BABY”. I attached it to the front of the bag using adhesive squares. Then I added an adorable gold puffy heart. 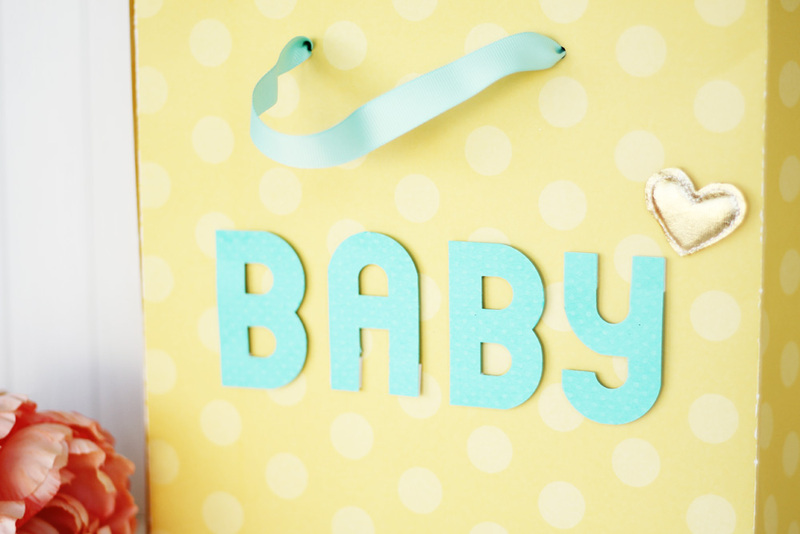 Since there are so many different designer poster boards, you will be sure to find exactly what you need to create any kind of gift wrap for that special baby shower. Recently, the family gathered to celebrate little Paul’s baby blessing. 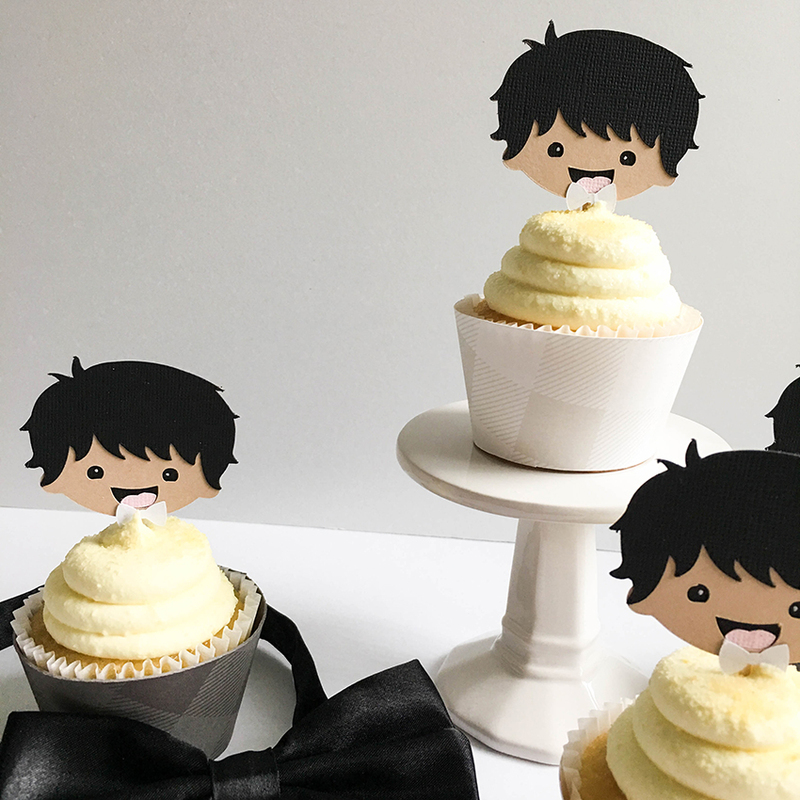 I offered to decorate the cupcakes and between Bazzill’s gorgeous plaid cardstocks (in masculine shades of gray and white) and the We R Memory Keepers Party Board, it was so easy! 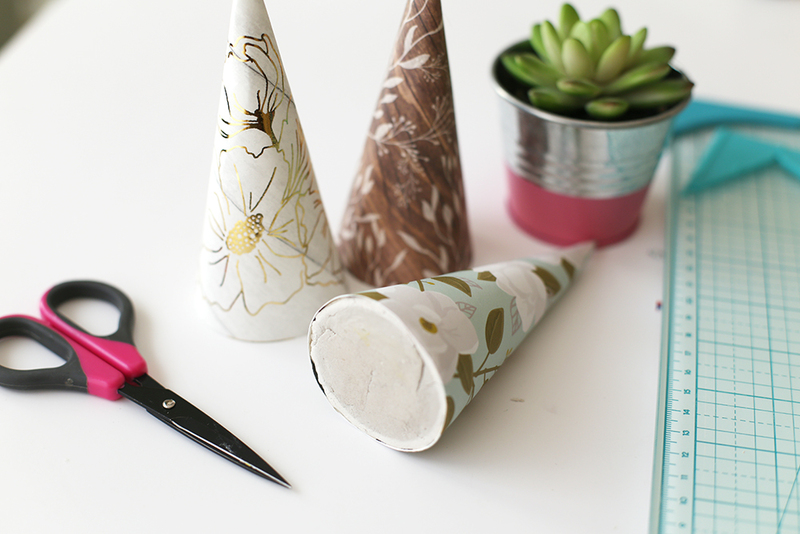 Making the cupcake wraps was a breeze, but I do have a helpful tip for you. 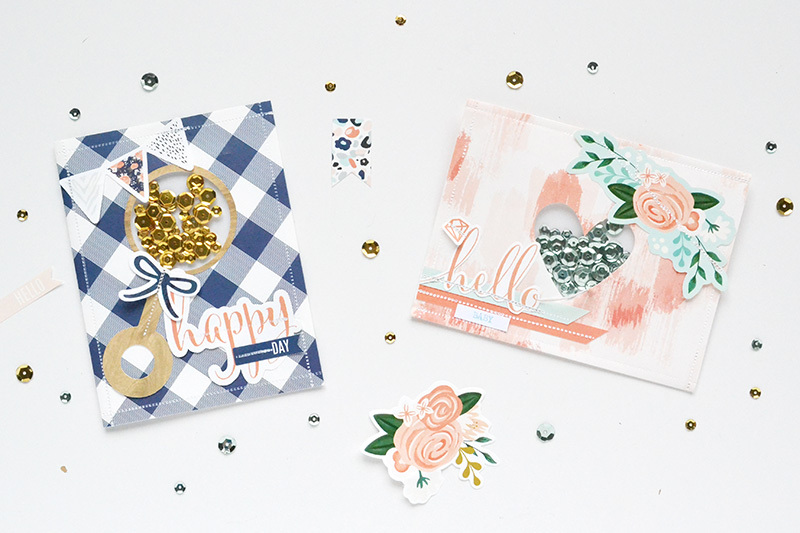 Bazzill cardstock is so wonderfully sturdy, your regular tape runner will probably not be enough to keep the wraps securely fastened. I suggest using Sticky Thumb red tape. 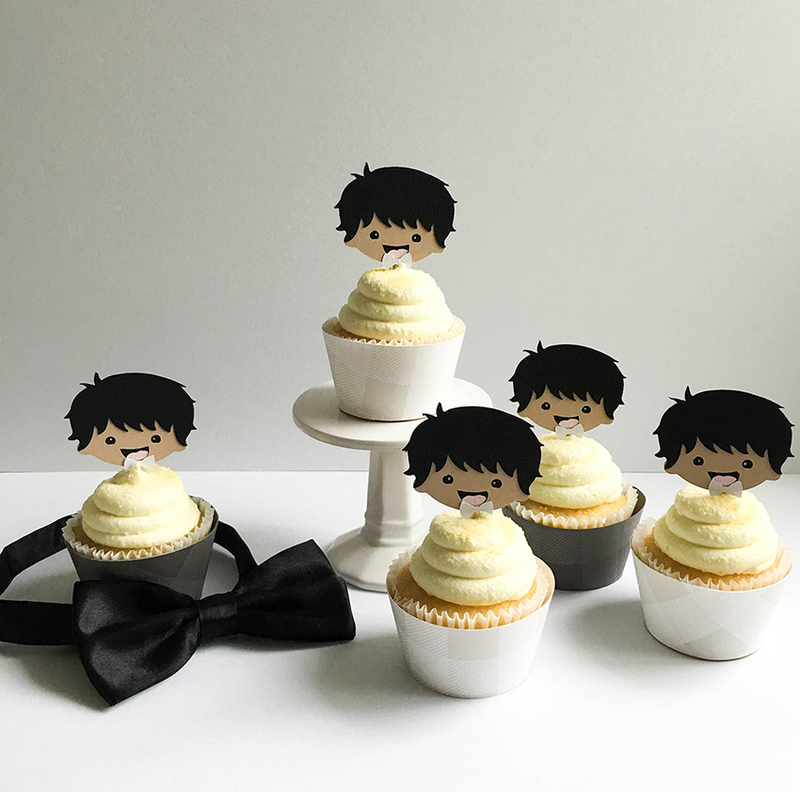 While the wraps themselves were handsome enough, I couldn’t help but add die-cut renditions of my handsome nephew. Again, Bazzill cardstock is the best! 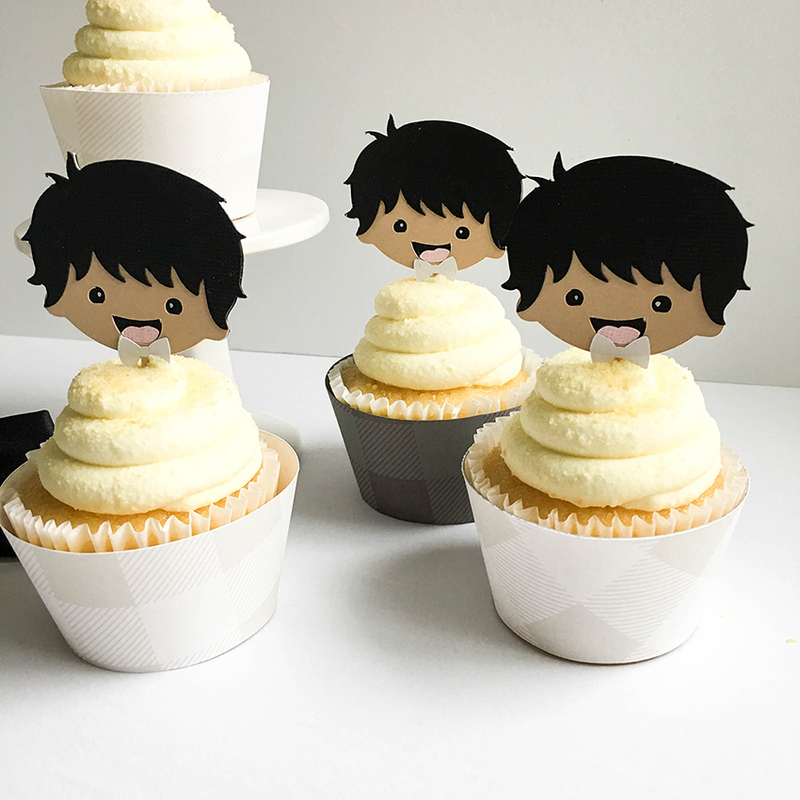 And yes, this little man actually has a lot of dark, crazy hair, just like these cupcake toppers! 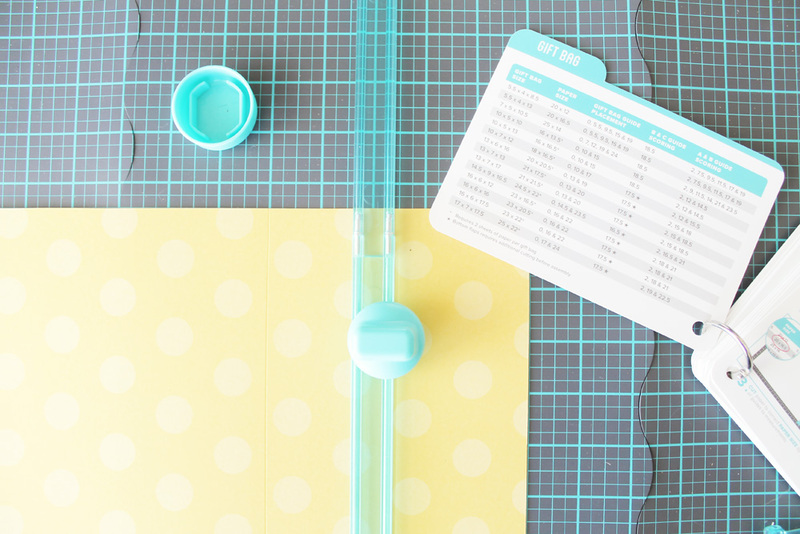 If you don’t already have the DIY Party Board on hand, it is the best investment! I’ve now used it for four family gatherings, and everyone is so impressed with how “custom” my décor is. From birthdays to baby boys, you will impress, too! Happy creating! Hello We R Fans! Kimberly here today with some fun décor that could be used for a baby shower, and then once the shower is over, for the baby’s room! 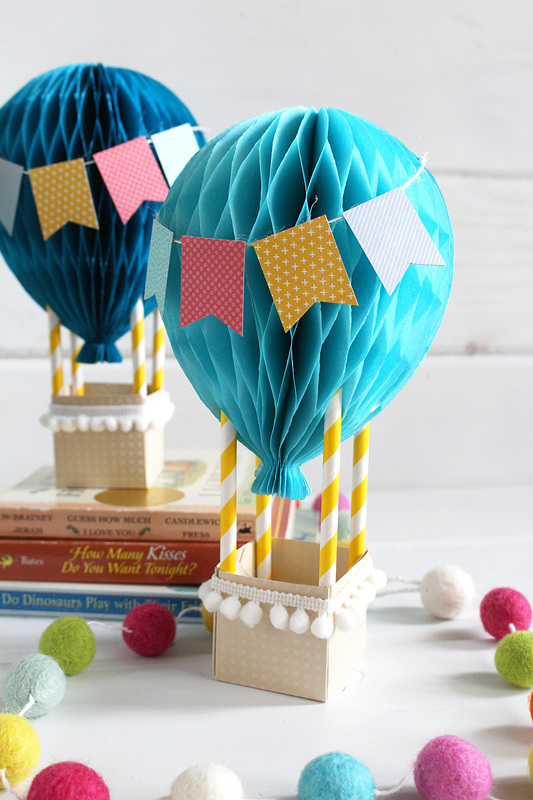 I am long removed from the world of babies (as mine is now 11), but as I scrolled through Pinterest, hot air balloons kept popping up. 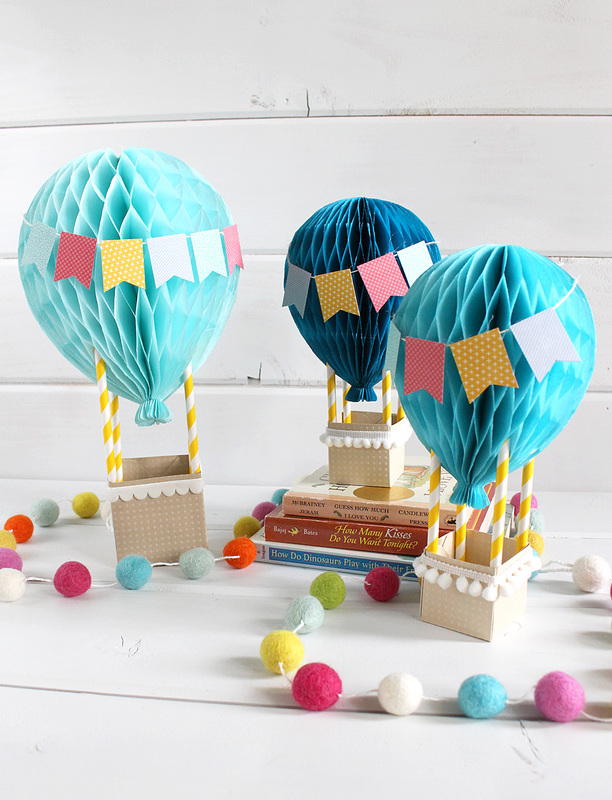 I knew I had all the supplies and tools I needed to create some fantastic balloons with my We R Memory Keepers stash! First to be created was the balloons. 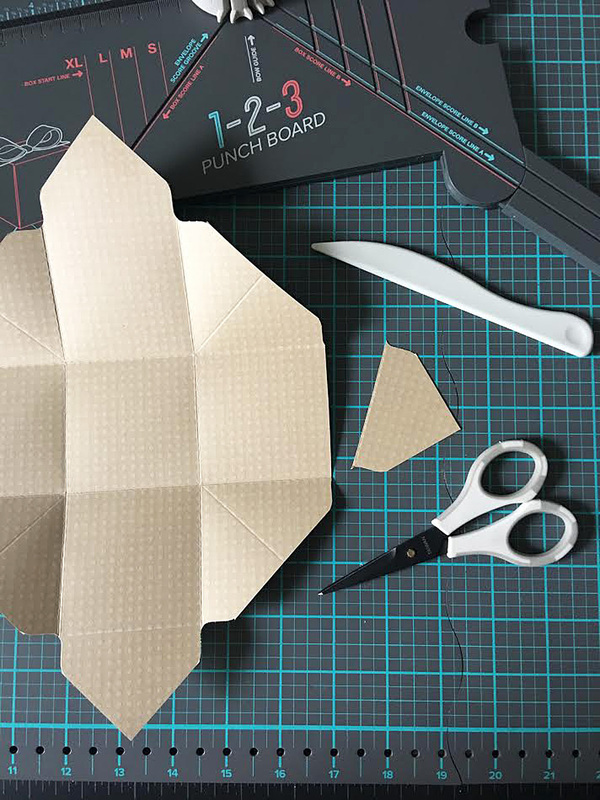 Immediately the Honeycomb pads came to mind, along with a great balloon-shaped stencil in the DIY Party Honeycomb Stencil pack. I placed the template on the sealed edge of the Large Honeycomb Ocean Pads. I traced one large balloon and two smaller balloons. I used the three different colors in the package. 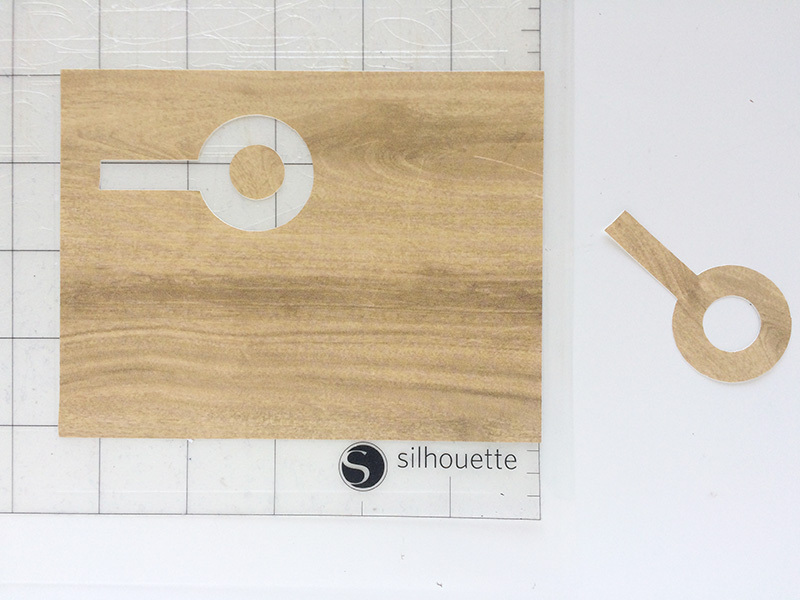 Be sure and slide your template all the way to the bottom of the pad, that way, you can get more shapes from your pad. Once two of each balloon color and size were cut, I adhered the two similar shapes together using a strong, dry adhesive. Dry adhesive is the only way to go when adhering the thin paper of the honeycomb pads. Adhesive was placed on the back of the one side. Then the two sides of the honeycomb were pinched together, creating a completely three-dimensional balloon! Once the balloons were created, banners were added for extra color and fun. 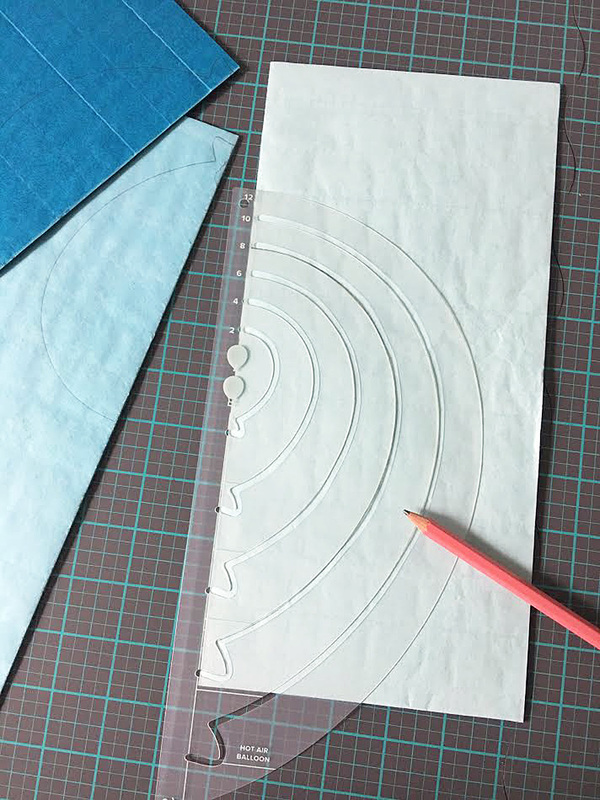 Using the Banner Punch Board, patterned paper was cut into small pieces. I trimmed my American Crafts Oh Happy Life paper to 1 inch strips. I lined the strips up with the center line (marked on the board), and cut with the blade. I find that cutting towards the inside from the right side and then the left side results in a cleaner cut. The paper banners were glued to a piece of twine. The twine was cut long, allowing me to wrap it around the balloon and tie it to the correct size. 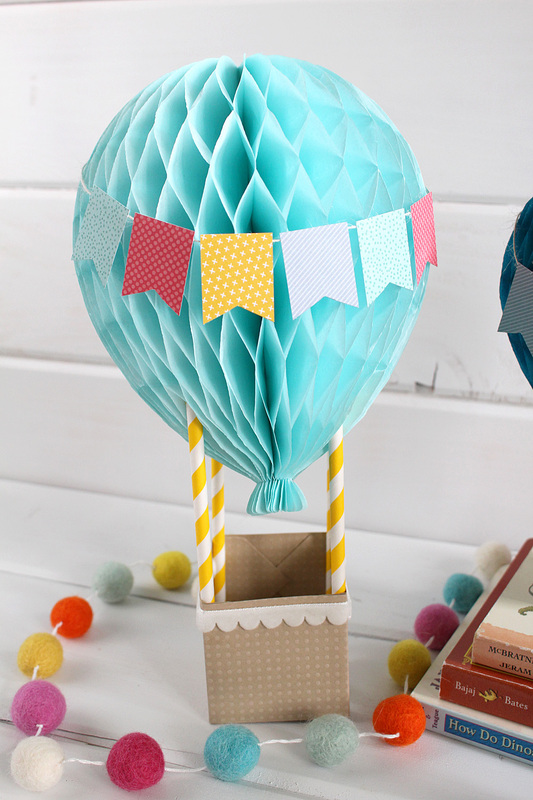 The next item that needed to be created was the basket for the hot air balloon. Using a piece of Bazzill Dotted Swiss card stock and the 1-2-3 Punch Board, I created small boxes. 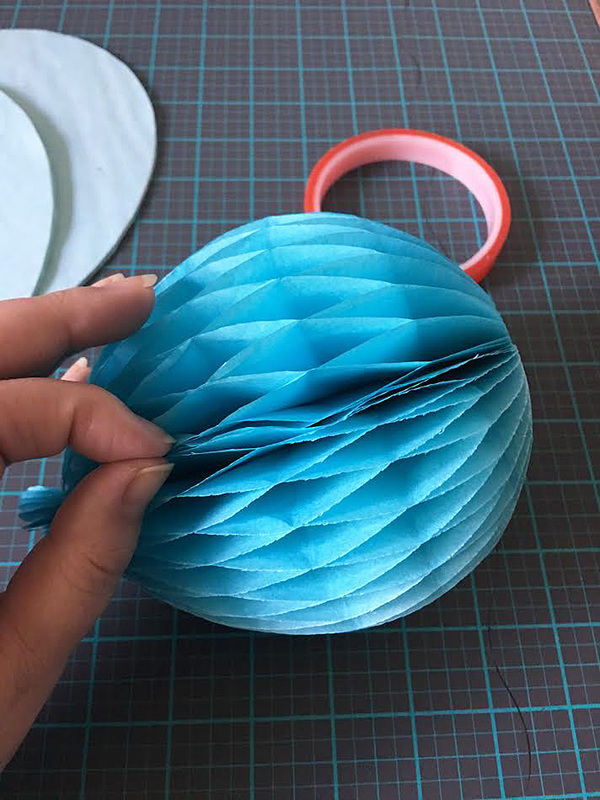 The box for the larger balloon was 2 ½” on all sides. The small box, of which I needed two, was 1 ¾” on all sides. The punch board has all the dimensions printed on it, for ease of construction. Around the top of each box, I added a piece of different white trim. 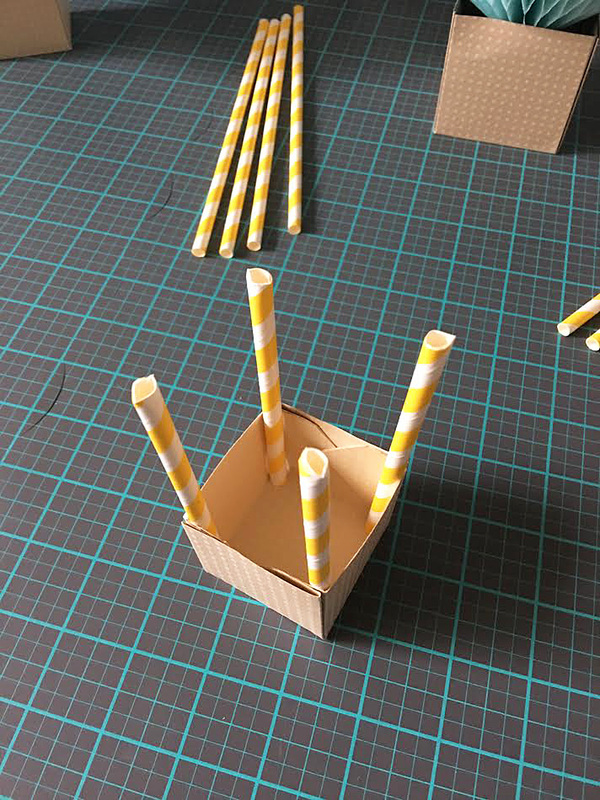 To hold up each balloon, paper straws were adhered to the inside of each corner of each box. I trimmed each straw to size. The honeycomb balloons slip easily on the top of the straws to stay in place. 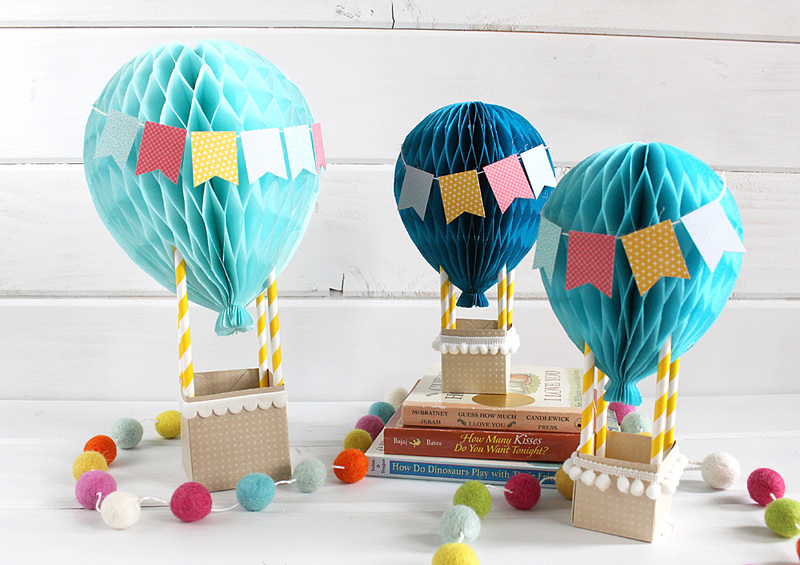 What color hot air balloons would you create? Good Monday morning friends, and welcome to Baby Week here on the blog! 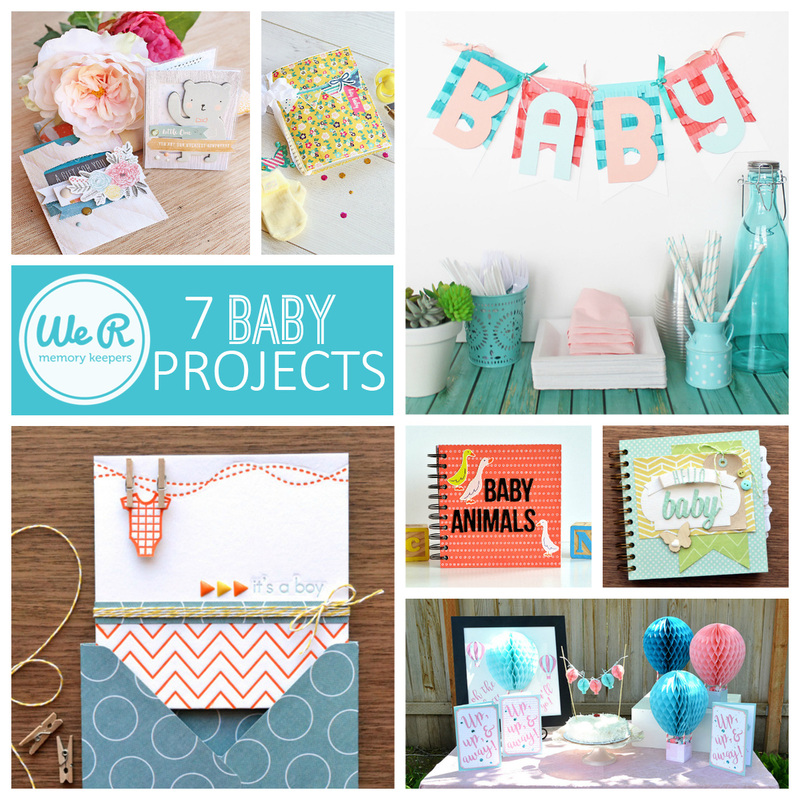 This week we’re featuring projects that are for babies, baby showers, and soon-to-be mommies. Our design team has cooked up some amazing inspiration for you! But to get things started, today we’ve got a roundup of past projects for you. Check out the list below of some of our favorite baby themed blog posts! 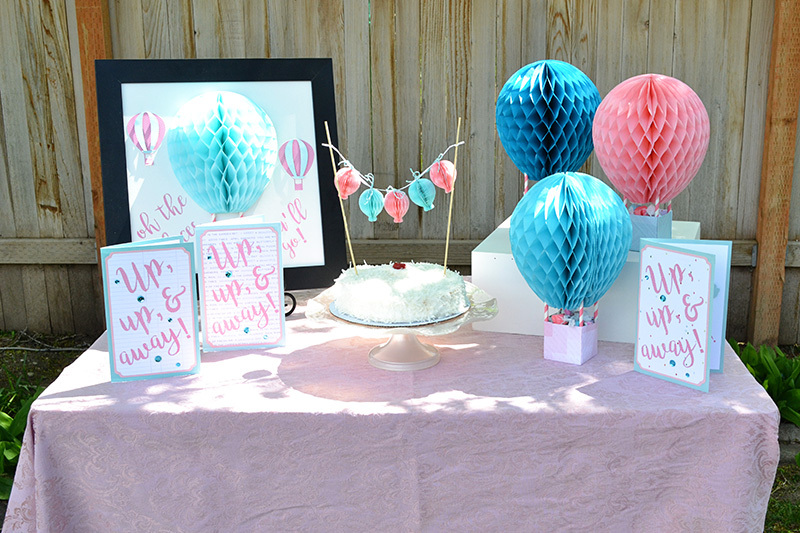 If you’re planning a baby shower or baby birthday party this spring, here’s a fun idea for a theme–hot air balloons! 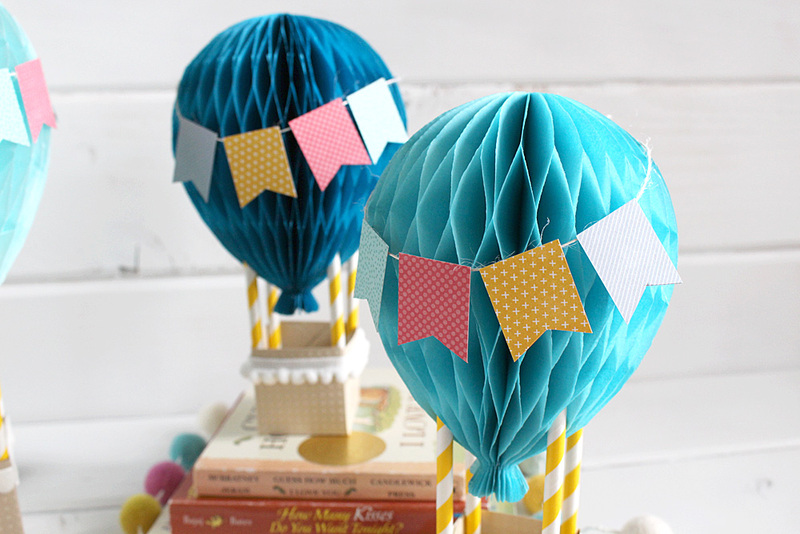 And what better way to make those hot air balloons than with our DIY Party Honeycomb Pads and Stencils? CLICK HERE for more photos and details about this fun project. 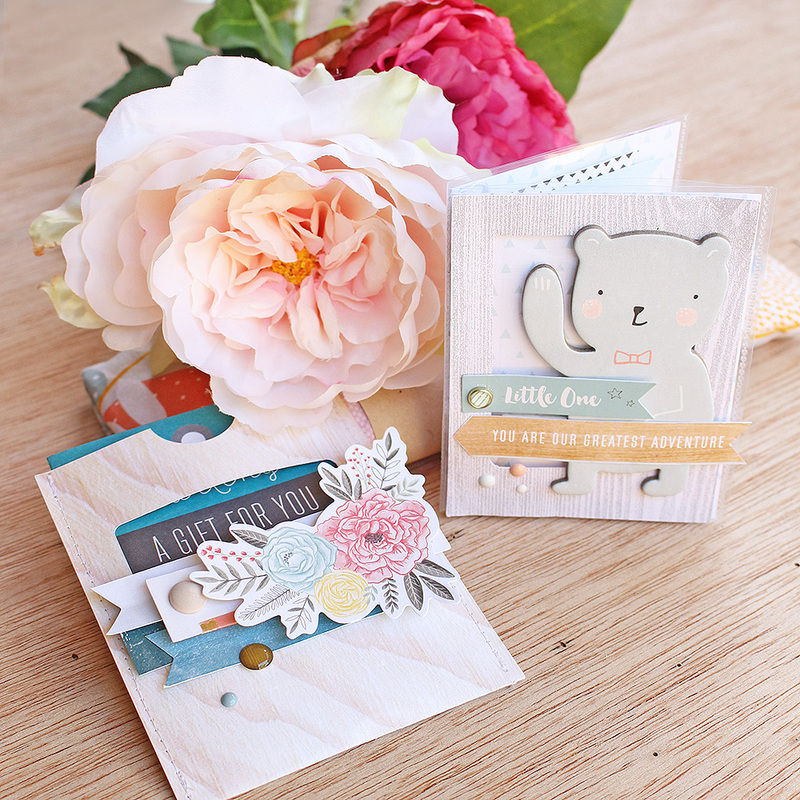 Make a baby keepsake album and interactive card with the Frame Punch Board and Photo Sleeve Fuse. 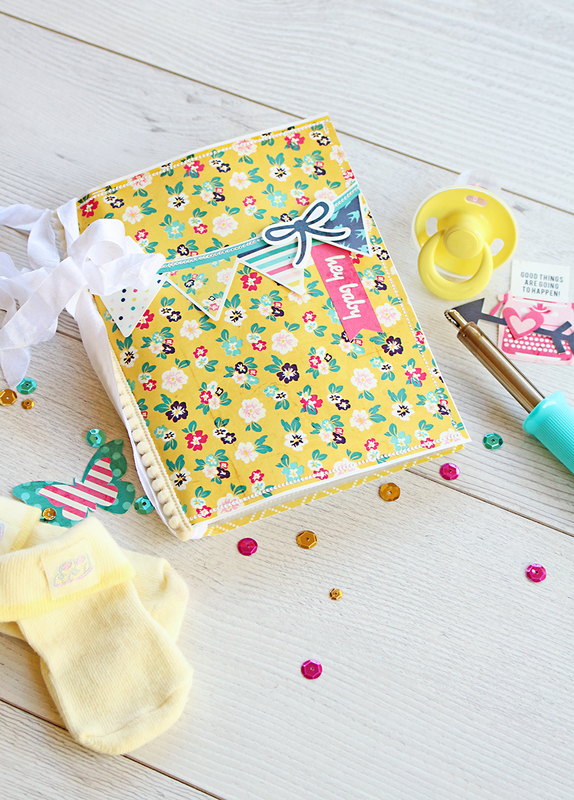 The mom-to-be will love this sweet handmade gift, and she’ll get to record all the exciting milestones as well. You can find a full tutorial HERE. 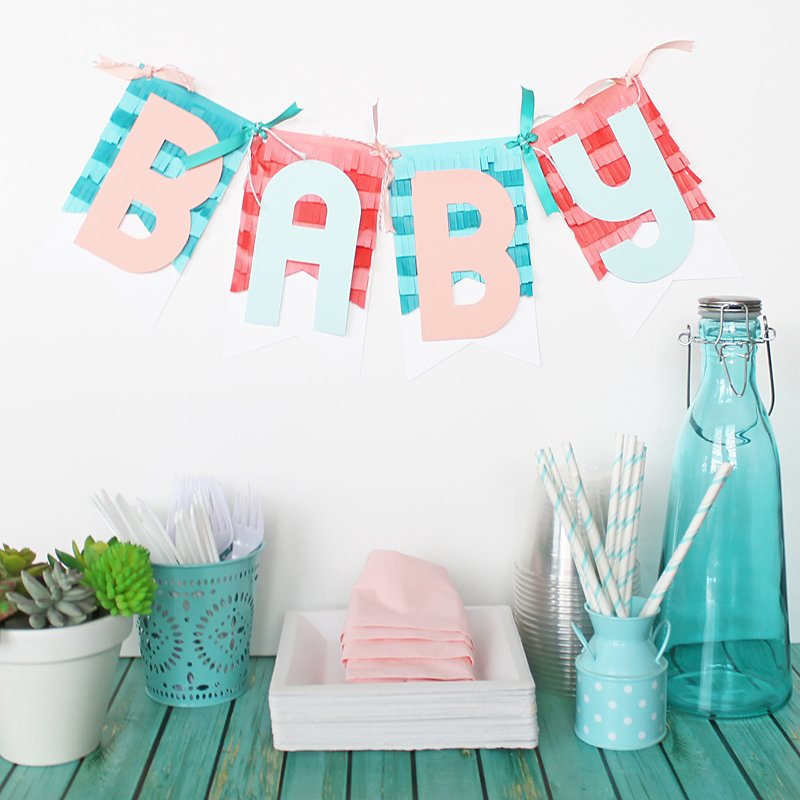 This darling baby banner would be perfect for a baby shower or baby birthday party! 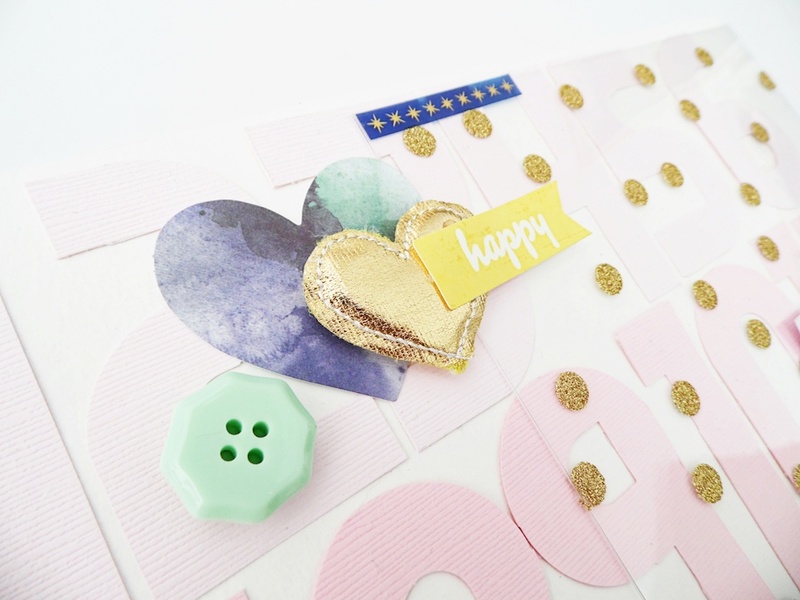 You can learn how to make your own with the Alphabet Punch Board and Banner Punch Board by clicking HERE. 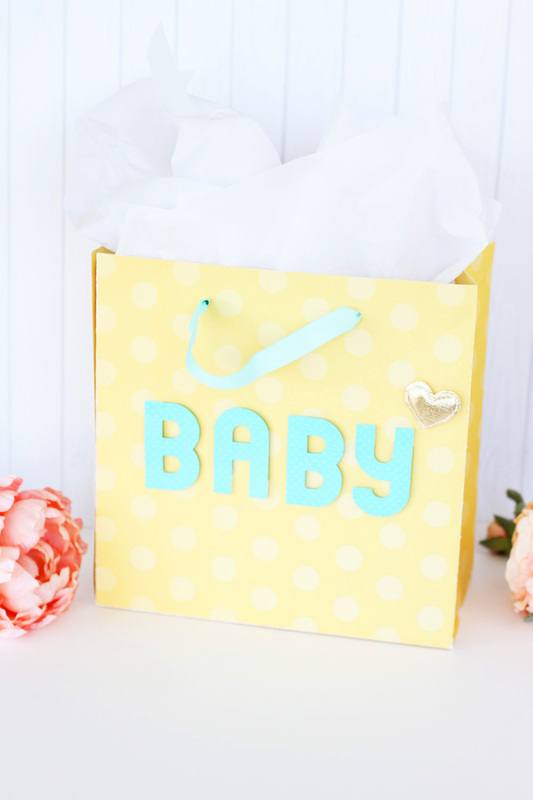 Get out your Cinch binding tool and some book board to make this darling baby gift idea. CLICK HERE for more photos, details, and instructions. 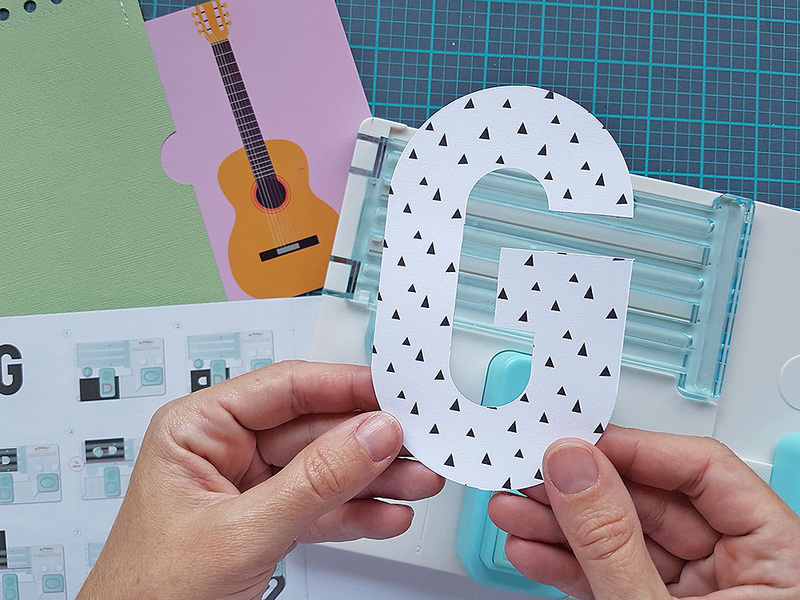 The unique and beautiful look of letterpress is the perfect way to announce the arrival of your little one. 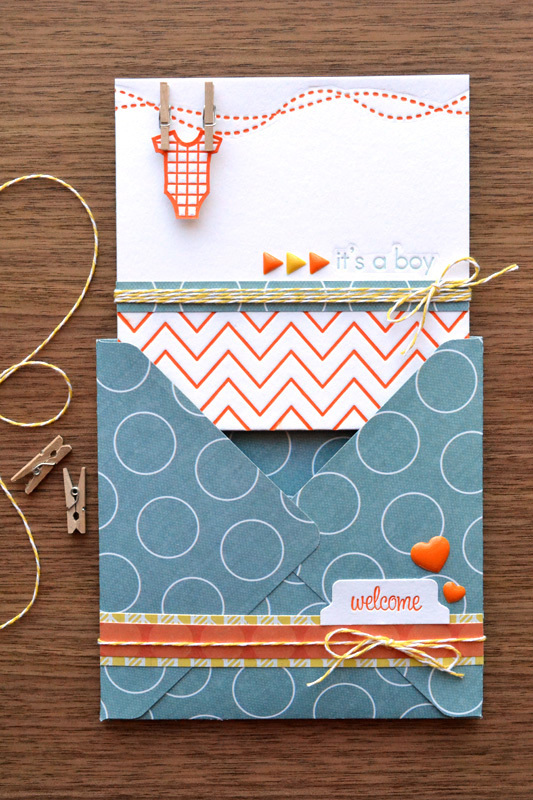 Learn how to make your own letterpress baby announcements with the Evolution Advanced and Letterpress Kit HERE. Record the changes in your baby during the first year in a special mini album. 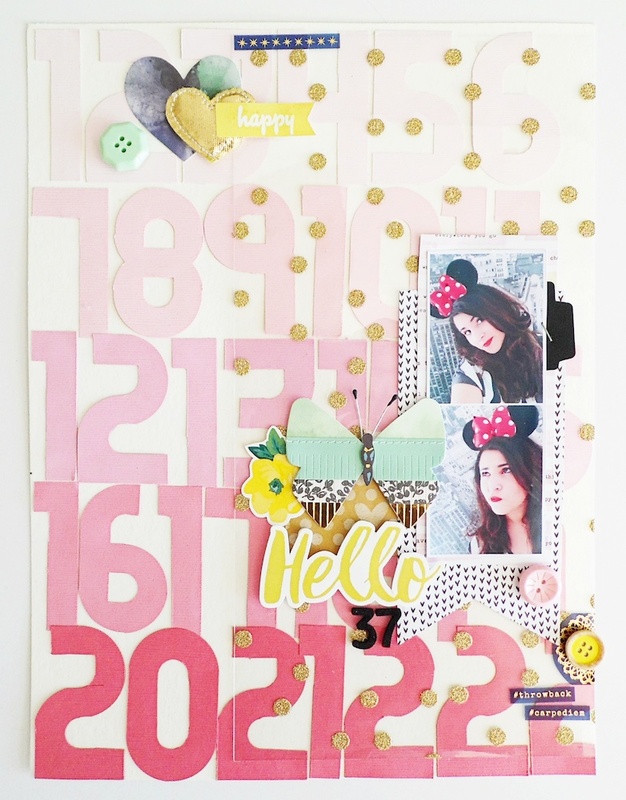 Take a photo each month, and record the exciting milestones, then bind all your pages together with The Cinch. You can find more photos and details HERE. 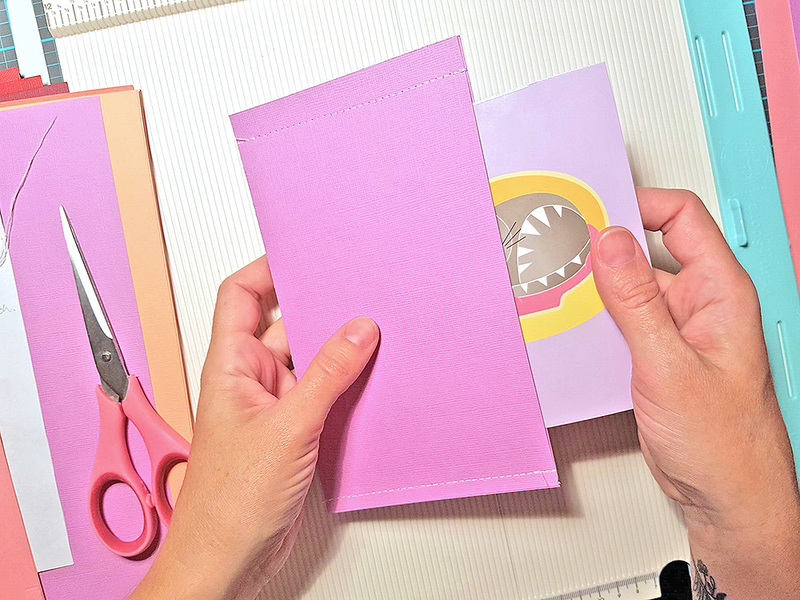 Pull out your Photo Sleeve Fuse to make a beautiful pregnancy keepsake album for the mom-to-be. Fill it with 4×6 photo sleeves and journaling cards so she can include monthly photos of her growing belly, plus her feelings about the exciting events to come. CLICK HERE for full instructions. Thanks so much for joining us today. We hope this roundup has provided some helpful inspiration for you. Be sure to come back each day this week for more baby themed project ideas from our design team. Crafty cheers!